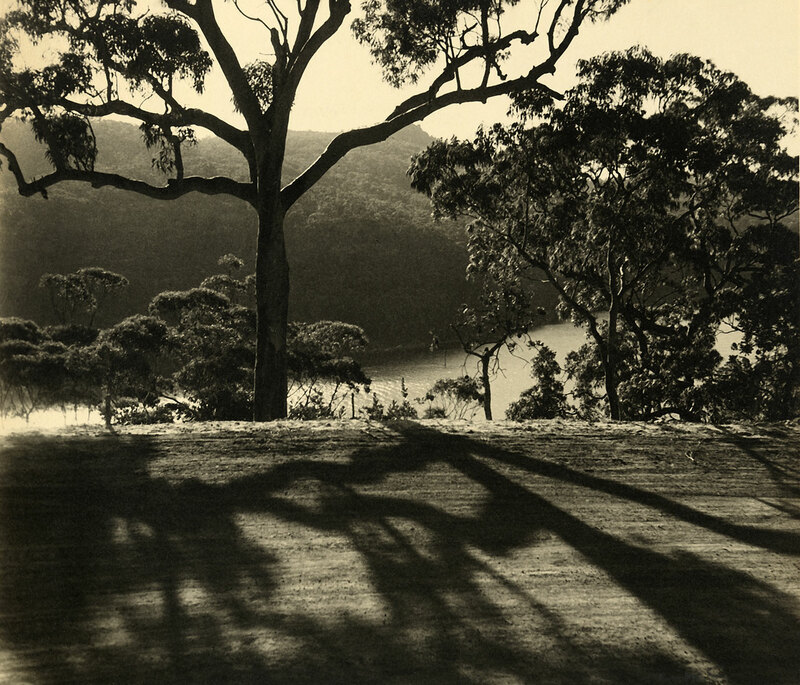 This is an important exhibition and book by Judy Annear and team at the Art Gallery of New South Wales, an investigation into the history of Australian photography that is worthy of the subject. 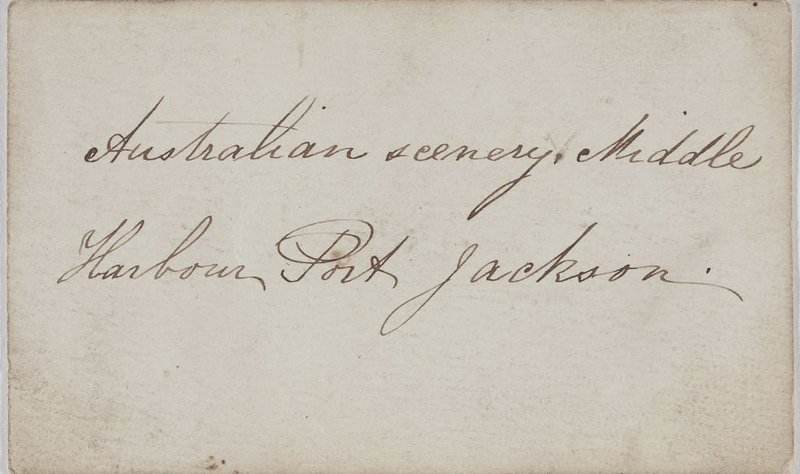 Unfortunately, I could not get to Sydney to see the exhibition and I have only just received the catalogue. I have started reading it with gusto. With regard to the exhibition all I have to go on is a friend of mine who went to see the exhibition, and whose opinion I value highly, who said that is was the messiest exhibition that she had seen in a long while, and that for a new generation of people approaching this subject matter for the first time it’s non-chronological nature would have been quite off putting. But this is the nature of the beast (that being a thematic not chronological approach) and personally I believe that modern audiences are a lot more understanding of what was going on in the exhibition than she would give them credit for. These questions are the nexus of Annear’s investigation and she seeks to answer them in the well researched chapters that follow, while being mindful of “preserving some of the slipperiness of the medium.” And there is the rub. 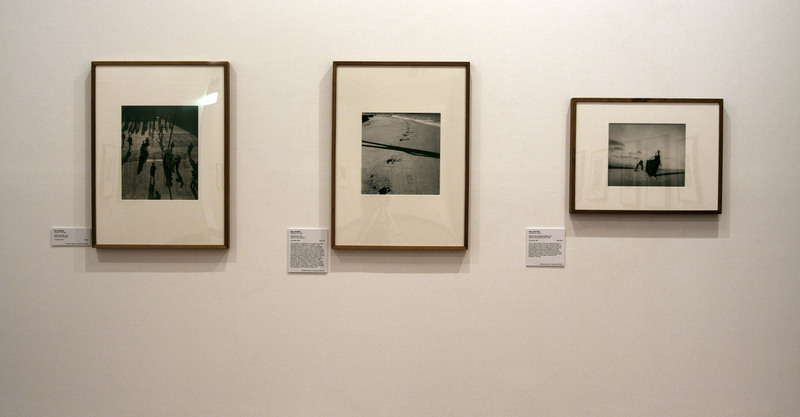 In order to define these classificatory sections in the exhibition and book, it would seem to me that Annear shoehorns these themes onto the fluid, mutable state of “being” of the photograph, imposing classifications to order the mass of photography into bite sized entities. 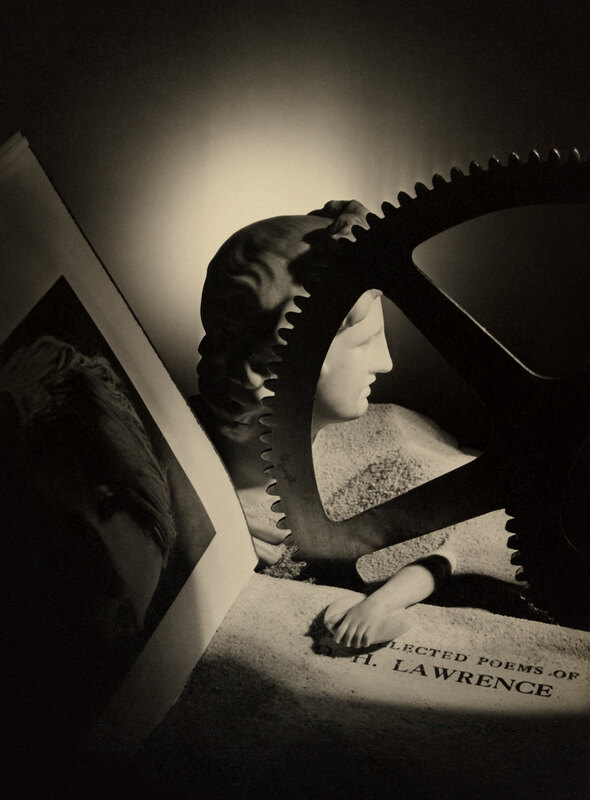 While “the book encourages the reader to explore connections – between different forms of photography, people and place, past and present” it also, inevitably, imposes a reading on these historical photographs that would not have been present at the time of their production. 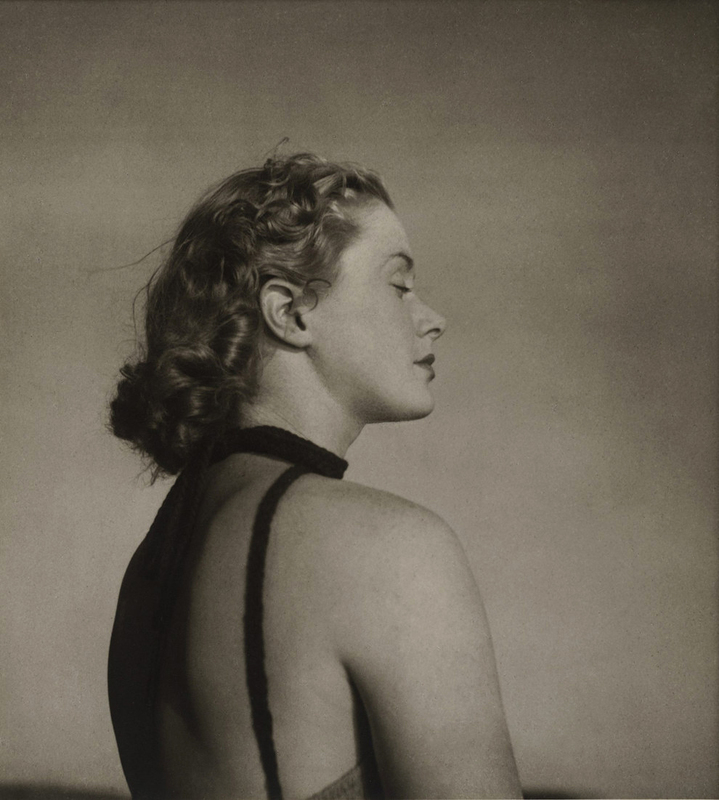 The press release for the book says, “The photograph and Australia investigates how photography was harnessed to create the idea of a nation.” Now I find the use of that word “harnessed” – as in control and make use of – to be hugely problematic. Personally, I don’t think that the slipperiness and mutability of photography can ever be controlled by anyone to help create the idea (imagination?) of a nation. Nations build nations, not photography. As a friend of mine said to me, it’s a long bow to draw… and I would agree. 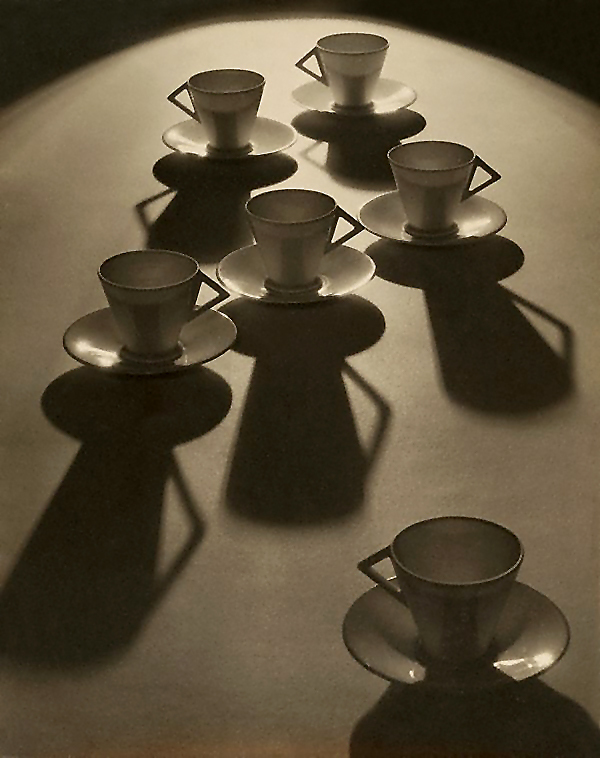 The crux of the matter is that THERE ARE NO HANDLES, only the ones that we impose, later, from a distance. There is no definitive answer to anything, there are always twists and turns, always another possibility of how we look at things, of the past in the present. 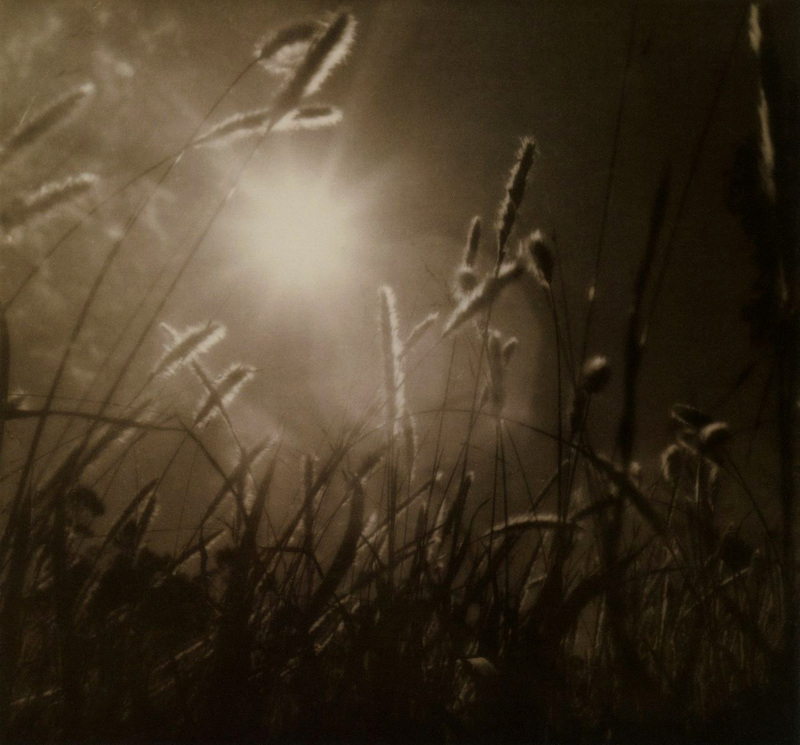 Photography and photographs, “with its ability to capture both things of the world and those of the imagination,” are always unstable (which is why the photograph can still induce A SENSE OF WONDER) – always uncertain in their interpretation, then and now. Photographs do not belong to a dimension or a classification of time and space because you feel their being NOT their (historical) consequence. Hence, all of these classifications are essentially the same/redundant. Perhaps it’s only semantics, but I think the word “utilises” – make practical and effective use of – would be a better word in terms of Annear’s enquiries. 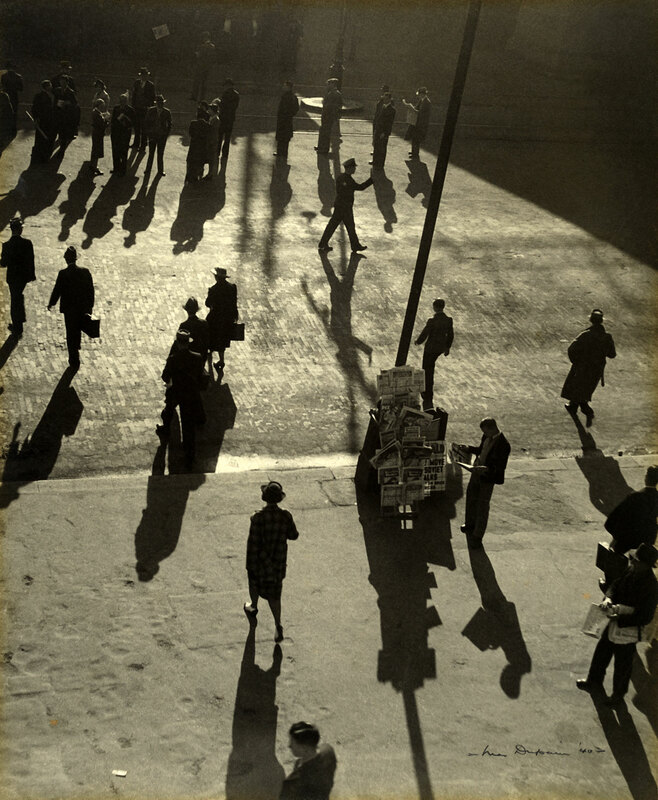 It also occurred to me to turn the question around: instead of “how photography was harnessed to create the idea of a nation”; instead, “how the idea of a nation helped change photography.” Think about it. Finally, a comment on the book itself. Beautifully printed, of a good size and weight, the paper stock is of excellent quality and thickness. 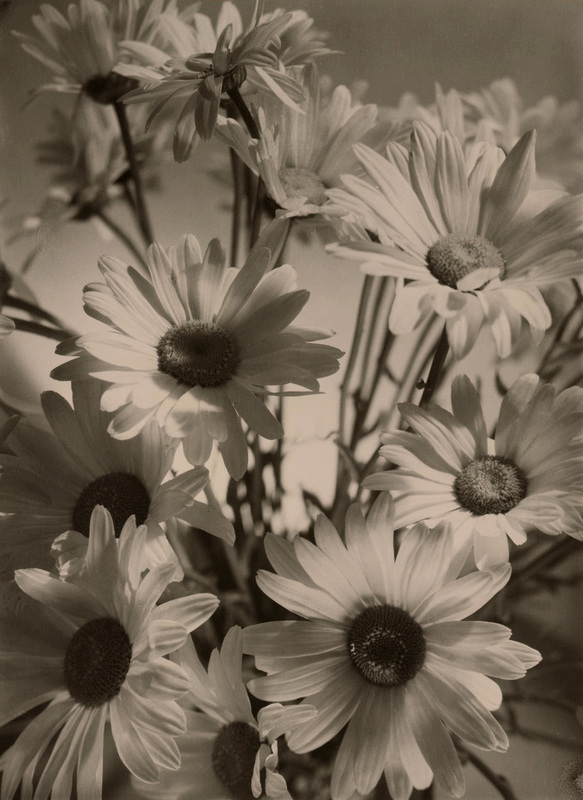 The type is simple and legible and the book is lavishly illustrated with photographs. The reproductions are a little ‘flat’ but the main point of concern is the size of the reproductions. 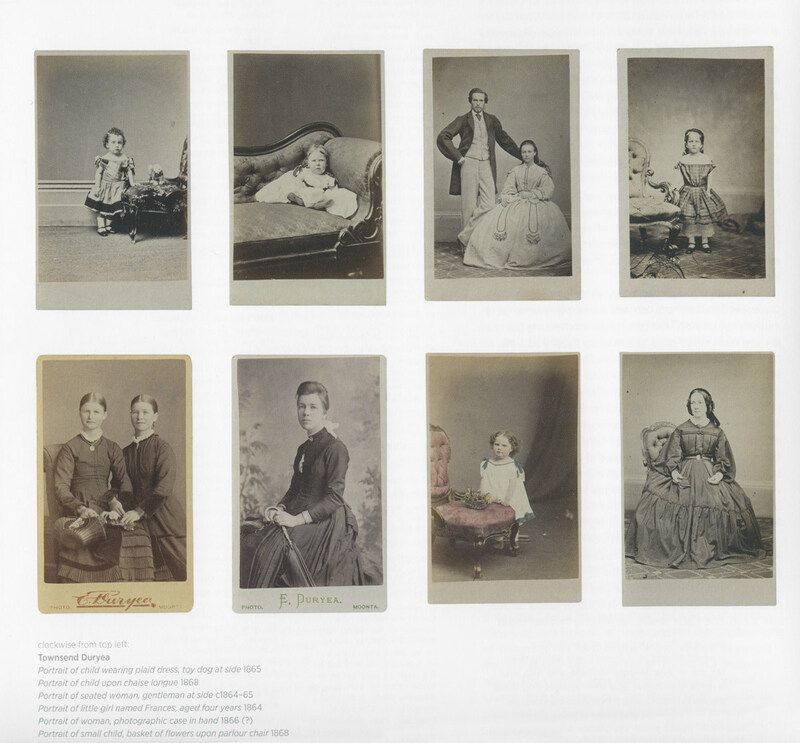 Instead of reproducing carte de visite at 1:1 scale (that is, 64 mm × 100 mm), their mounted on card size – they are reproduced at 40 mm x 68 mm (see p. 236 of the catalogue below). Small enough already, this printing size renders the detailed reading of the images almost impossible. 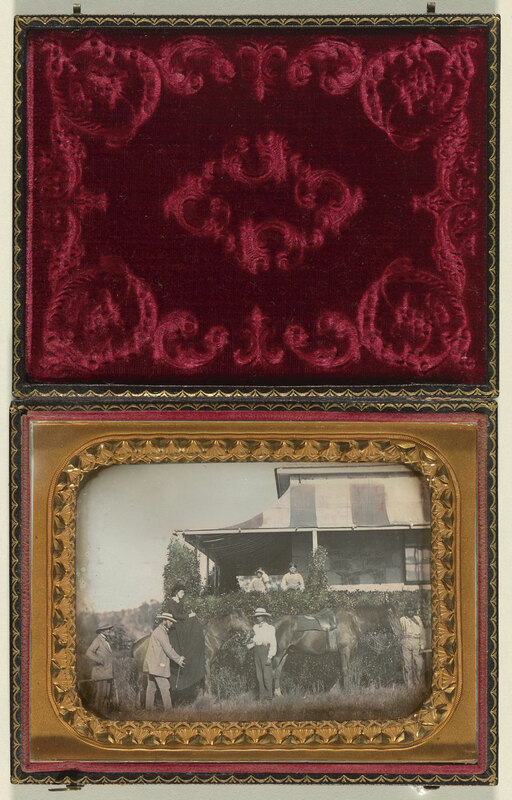 Worse, the images are laid out horizontally on a vertical page, with no size attribution of the original, nor whether they are 1/9th, 1/6th daguerreotype’s or ambrotypes, CDV’s or cabinet cards next to the image. 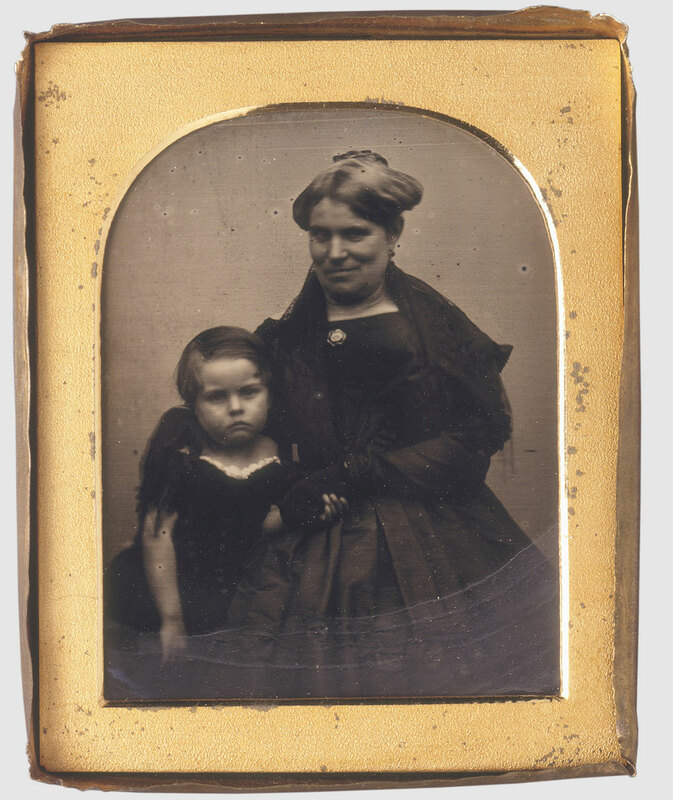 The reproduction size of the daguerreotypes and ambrotypes is even worse, making the images almost unreadable. 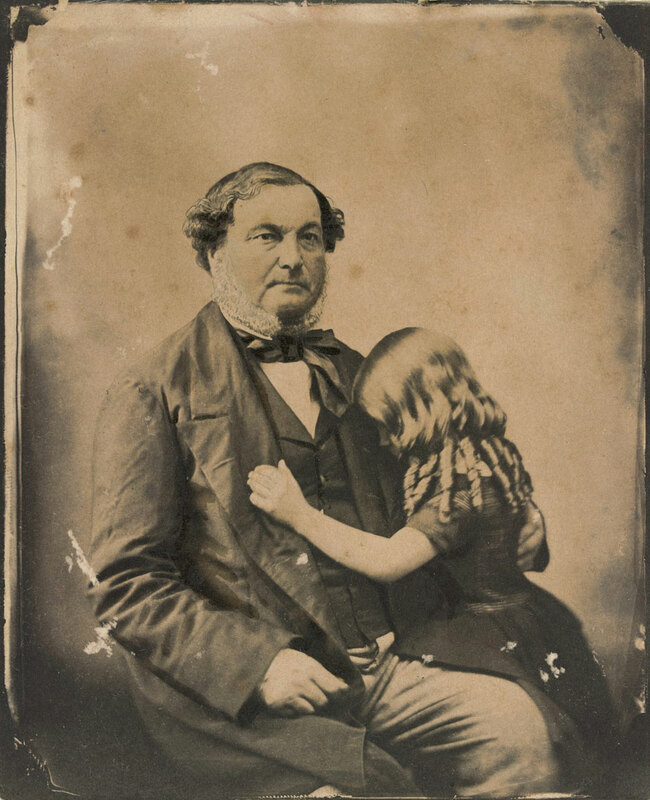 For example, in an excellent piece of writing at the end of the first chapter, “Time”, Annear refers to “an anonymous 1855 daguerreotype taken at Ledcourt, Victoria, of Isabella Carfrae on horseback where we see a servant standing on the verandah, shading her eyes,”. 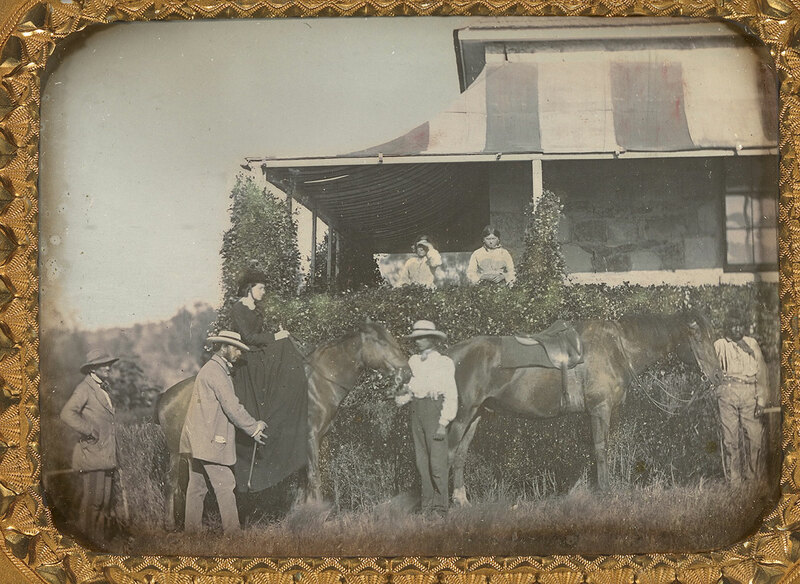 In the image in this posting (below) we can clearly see this woman standing on the verandah, but in the reproduction in the book (p. 139), she is reduced to a mere smudge in history, an invisibility caused by the size of the reproduction, thereby negating all that Annear comments upon. Instead of the “subject in the photograph presses so close to the picture plane that we know for the time of the exposure they look directly into an unknowable future and collide now with our gaze as we look back,” there is no pressing, hers has no presence, and our gaze cannot collide with this vision from the future past. Why designers of photographic books consistently fall prey to these traps is beyond me. 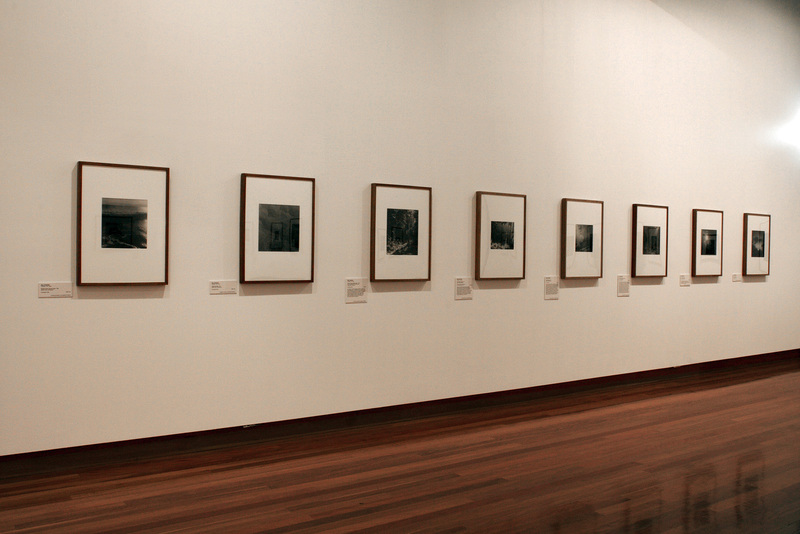 Many thank to the Art Gallery of New South Wales for allowing me to publish the photographs and text in the posting. Please click on the photographs for a larger version of the image. 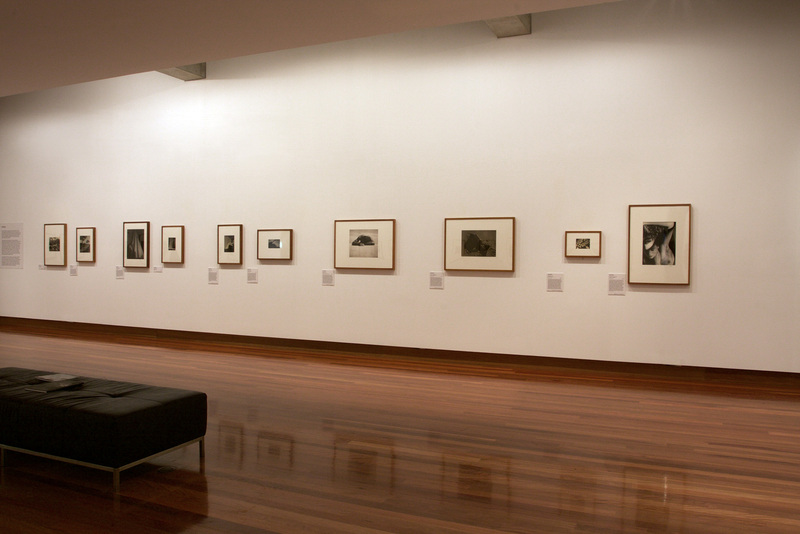 The first large-scale exhibition of its kind to be held in Australia in 27 years, The photograph and Australia presents more than 400 photographs from more than 120 artists, including Richard Daintree, Charles Bayliss, Frank Hurley, Harold Cazneaux, Olive Cotton, Max Dupain, Sue Ford, Carol Jerrems, Tracey Moffatt, Robyn Stacey, Ricky Maynard and Patrick Pound. 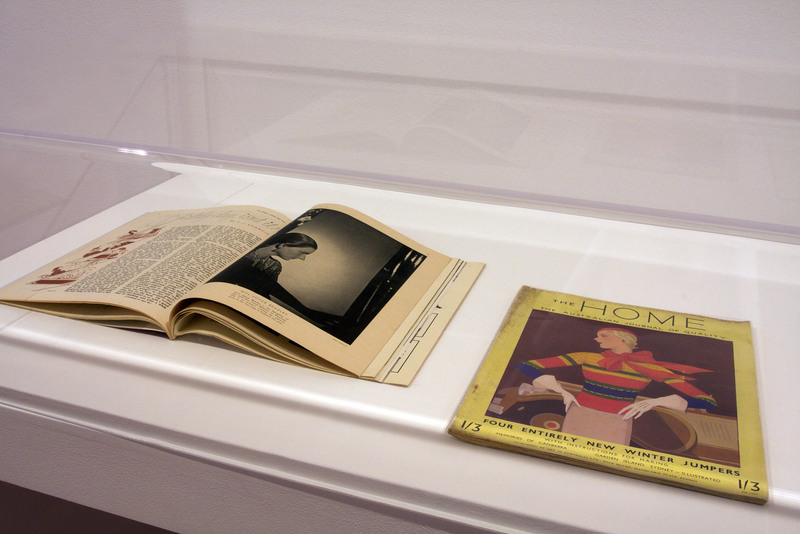 The works of renowned artists are shown alongside those of unknown photographers and everyday material, such as domestic and presentation albums. 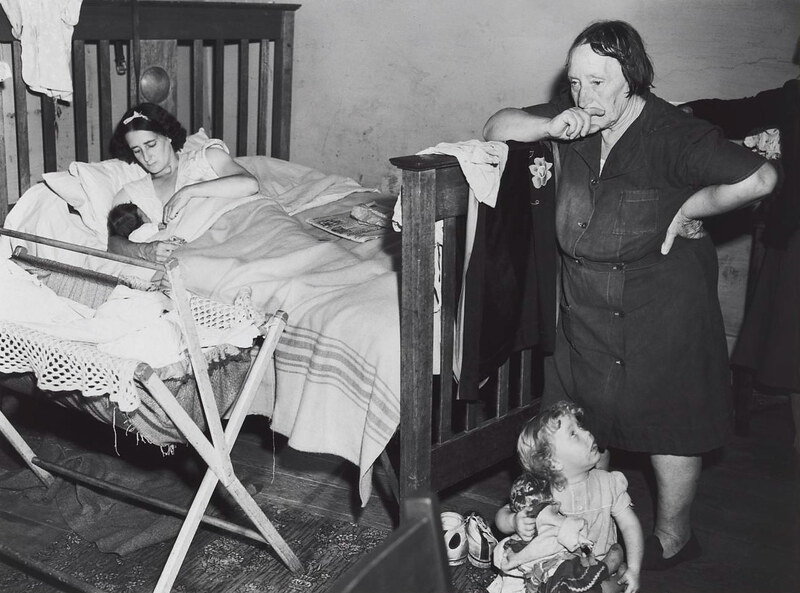 These tell peoples’ stories, illustrate where and how they lived, as well as communicate official public narratives. 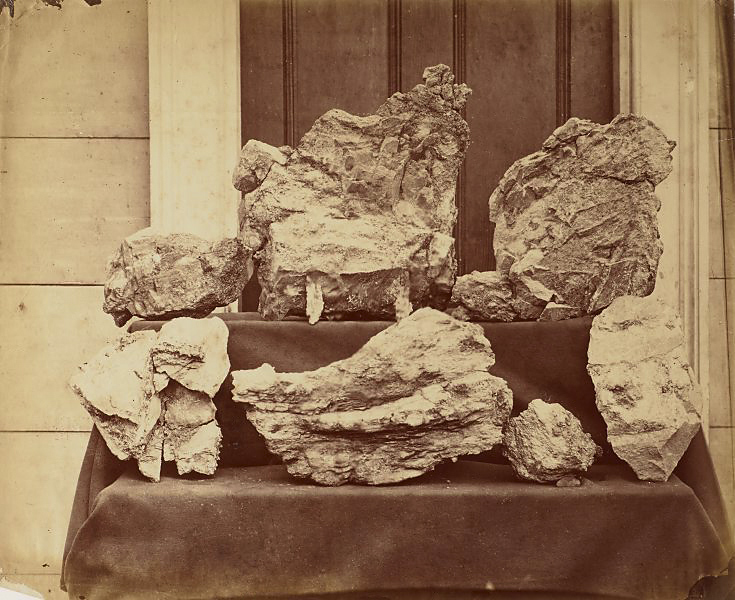 Sourced from more than 35 major collections across Australia and New Zealand, including the National Gallery of Australia, the National Library of Australia and the Australian Museum, The photograph and Australia uncovers hidden gems dating from 1845 until now. 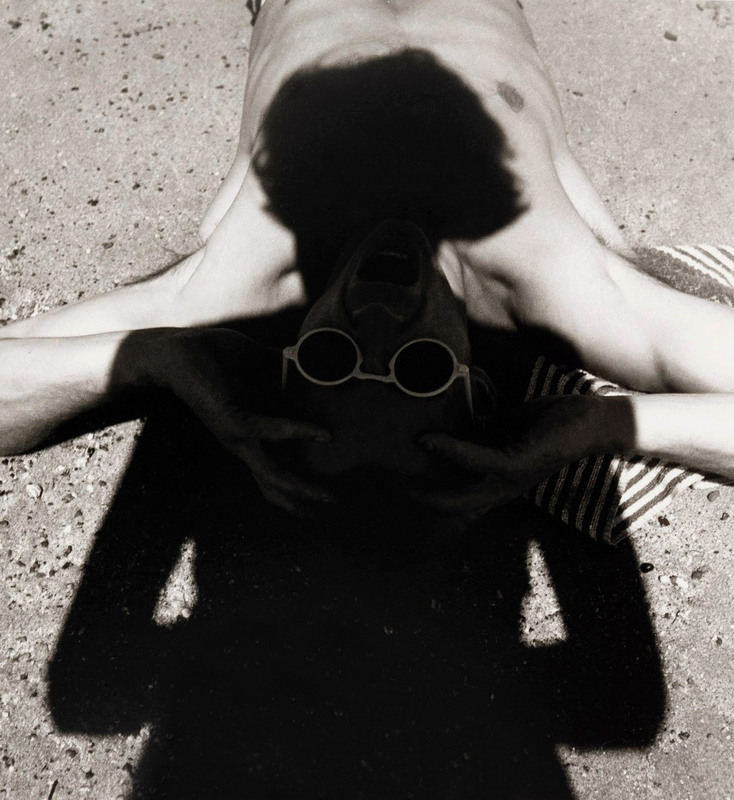 A richly illustrated publication accompanies the exhibition, reflecting the exhibition themes and investigating how Australia itself has been shaped by photography. 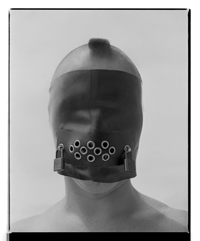 In the 1970s, cultural theorist Roland Barthes wrote an essay entitled The photographic message.13 While he focussed primarily on press photography and made a distinction between reportage and ‘artistic’ photography, his pinpointing of the special status of the photographic image as a message without a code – one could say, even, a face without a name – and his understanding of photography as a simultaneously objective and invested, natural and cultural, is relevant in the colonial and post-colonial context. Judy Annear. “Introduction,” in Judy Annear. 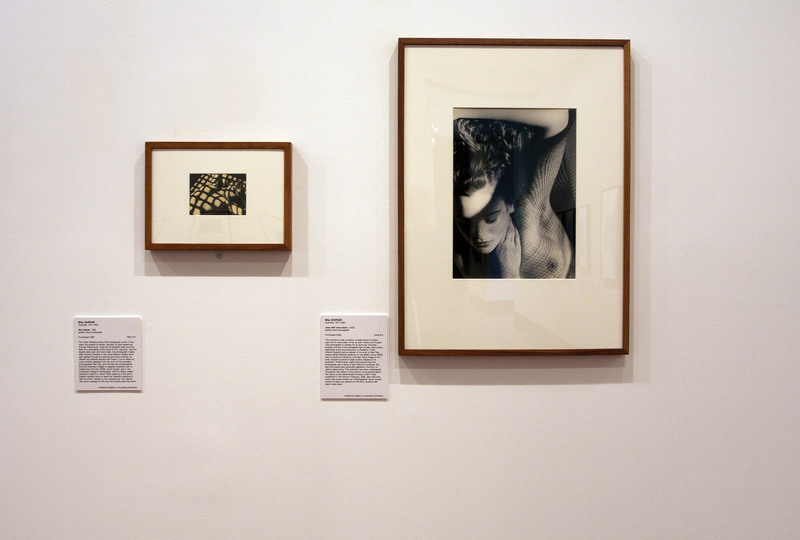 The photograph and Australia. 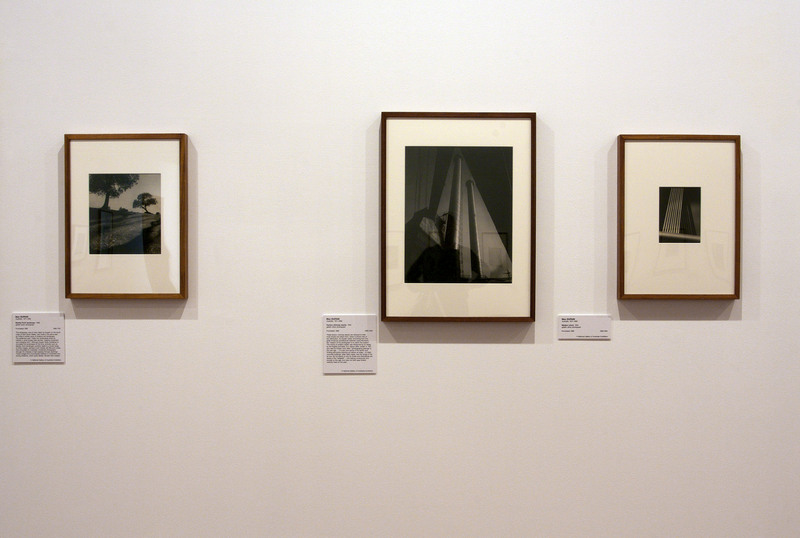 Sydney: Art Gallery of New South Wales, 2015. p. 13. 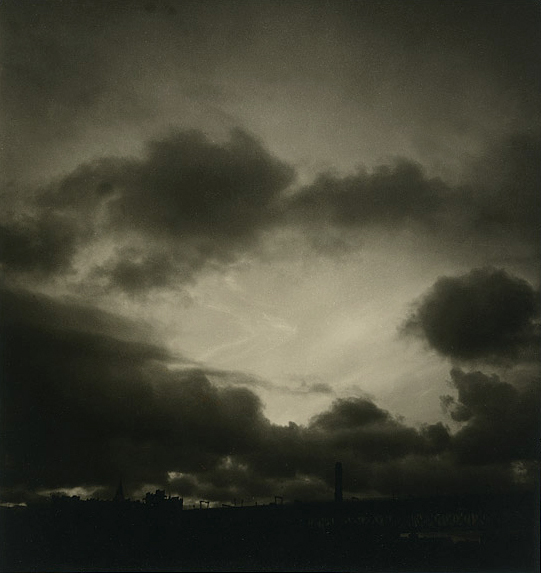 The relationship of the photograph to ‘Time’ is discussed in chapter one, which examines how contemporary artists such as Anne Ferran, Rosemary Laing and Ricky Maynard reinvent the past through photography. 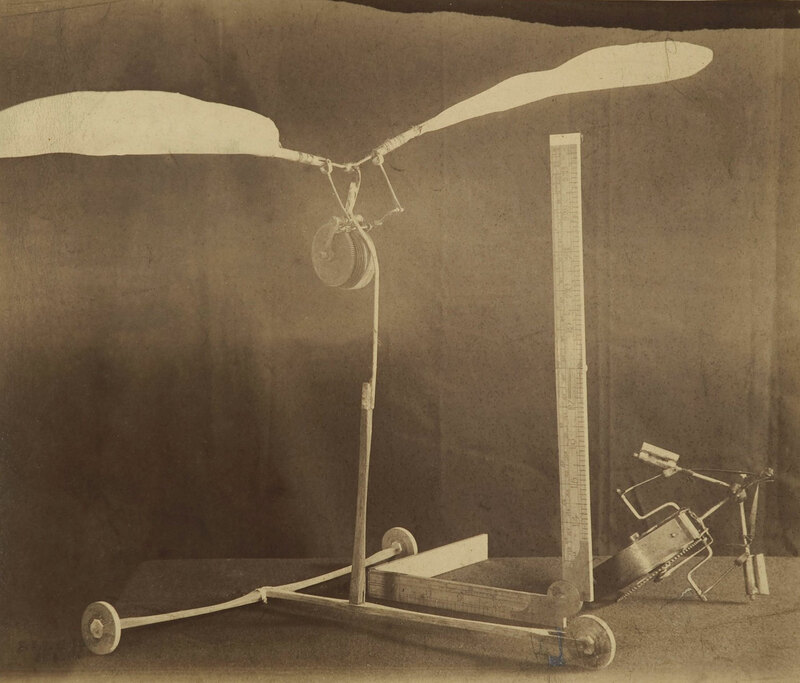 The activities of nineteenth-century photographers such as George Burnell and Charles Bayliss are also discussed… The manipulation by artists and photographers of imaginative time – the time of looking at the photographic image – allows for consideration of the nexus between space and time, how subjects can be momentarily tethered and, equally, how they can float free. 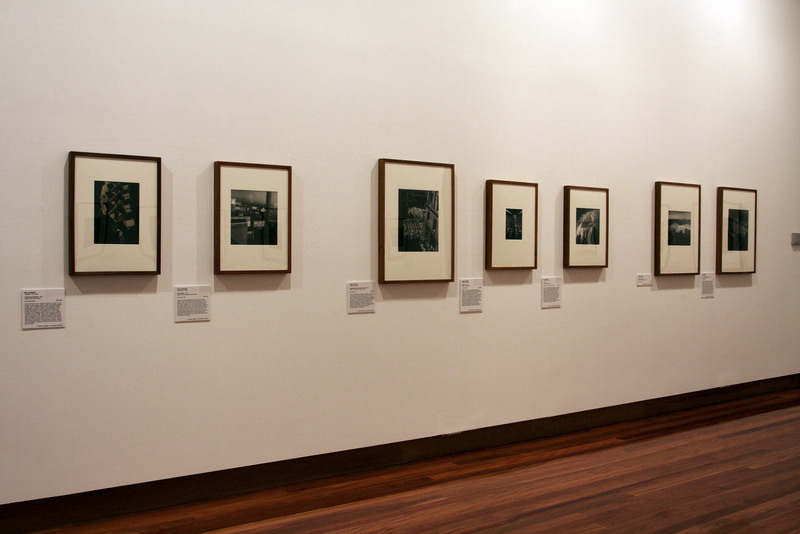 Chapter two considers the idea of ‘Nation’: looking at the public role of the photograph in representing Australia at world exhibitions before Federation in 1901. 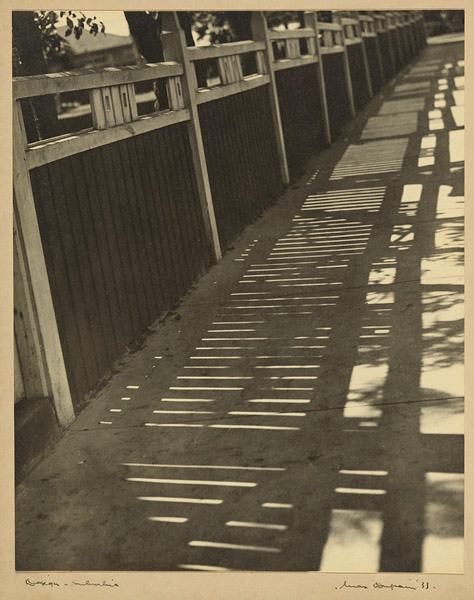 Photography in this period enabled new classificatory systems to come into existence… Of particular importance was the use of the photograph to cement Darwinistic views that determined racial hierarchies according to superficial physical differences. 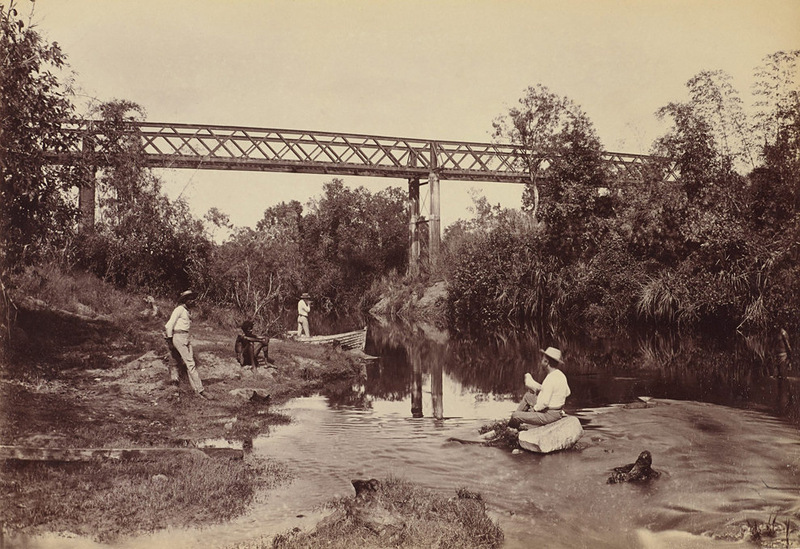 The photograph also advertised the growing colonies to potential migrants and investors through the depiction of landscapes and amenities. 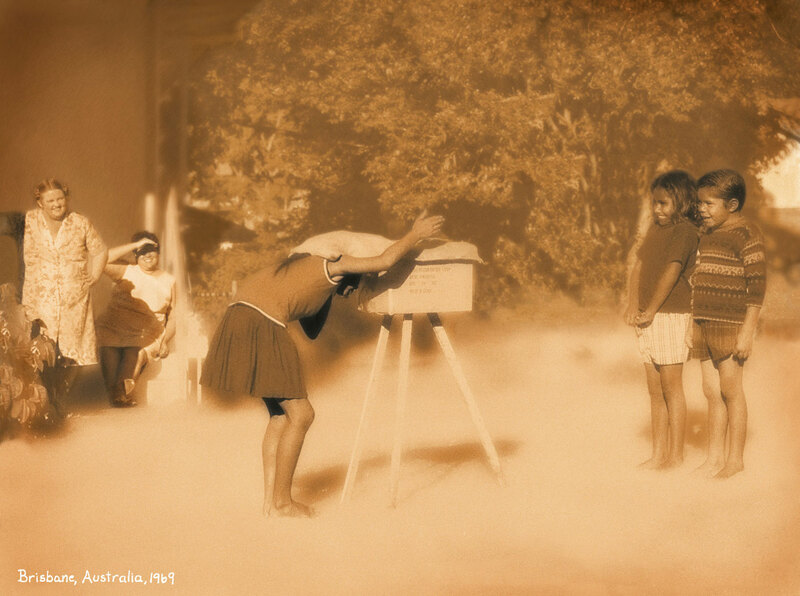 The third chapter, ‘People’, analyses the uncertain post-colonial heritage that all Australian inherit and how that can be evidenced and examined in photographs. 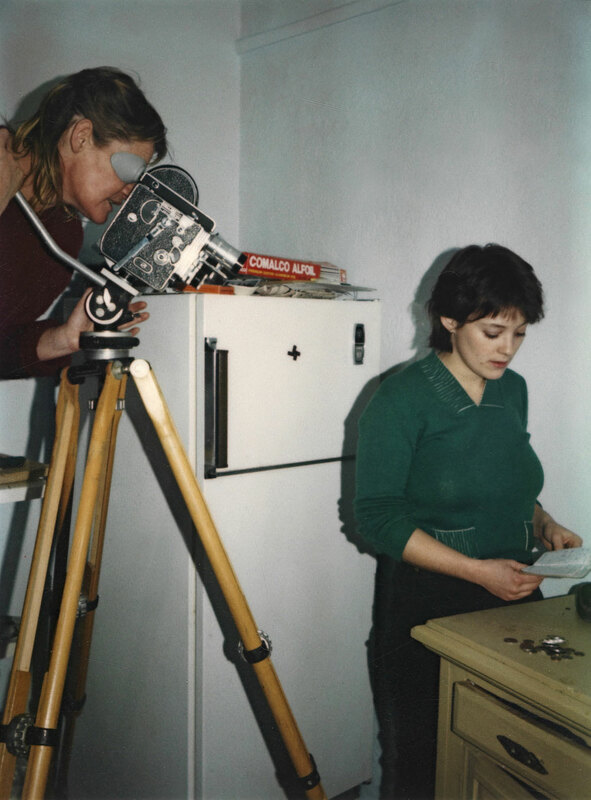 The chapter encompasses portraits by Tracy Moffatt and George Goodman, for example, and considerations of where and how people lived and chose to be photographed. 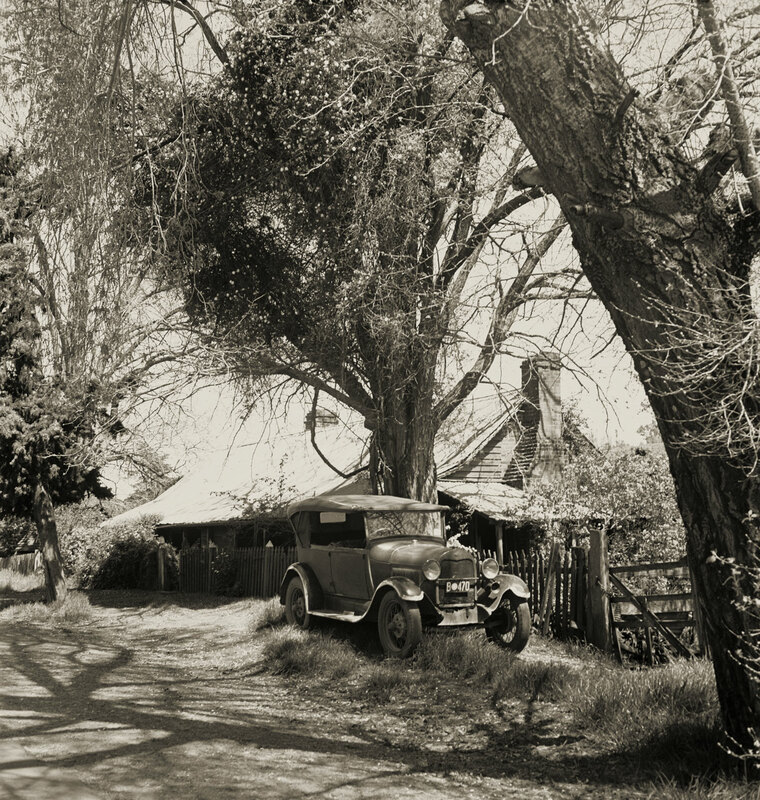 These include the people of the Kulin nation of Victoria, those who resided at Poonindie Mission in South Australia, the Yued people living at New Norcia mission in Western Australia, as well as the Henty family in Victoria, the Mortlocks of South Australia, the children living at The Bungalow in Alice Springs and the people of Tumut in New South Wales. 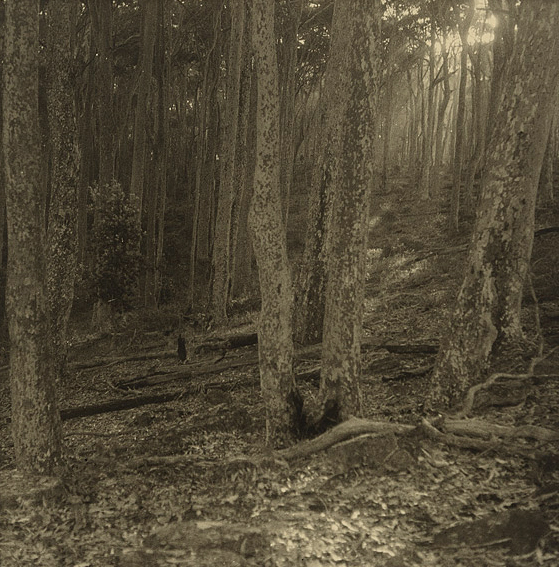 ‘Place’ is examined in chapter four, particularly in terms of the use of photography to enable exploration, whether to Antarctica (Frank Hurley), to map stars and further the natural sciences (Henry Chamberlain Russell, Joseph Turner), or to open up ‘wilderness’ for tourism or mining (JW Beattie, Nicholas Caire, JW Lindt, Richard Daintree) … Photographs are examined as both documents and imaginative interpretations of activity and place. Chapter five, ‘Transmission’, considers the traffic in photographs and the fascination with the medium’s reproducibility and circulation… The evidential aspect of the photograph has proven to be fleeting and only tangentially related to the thing it traces. 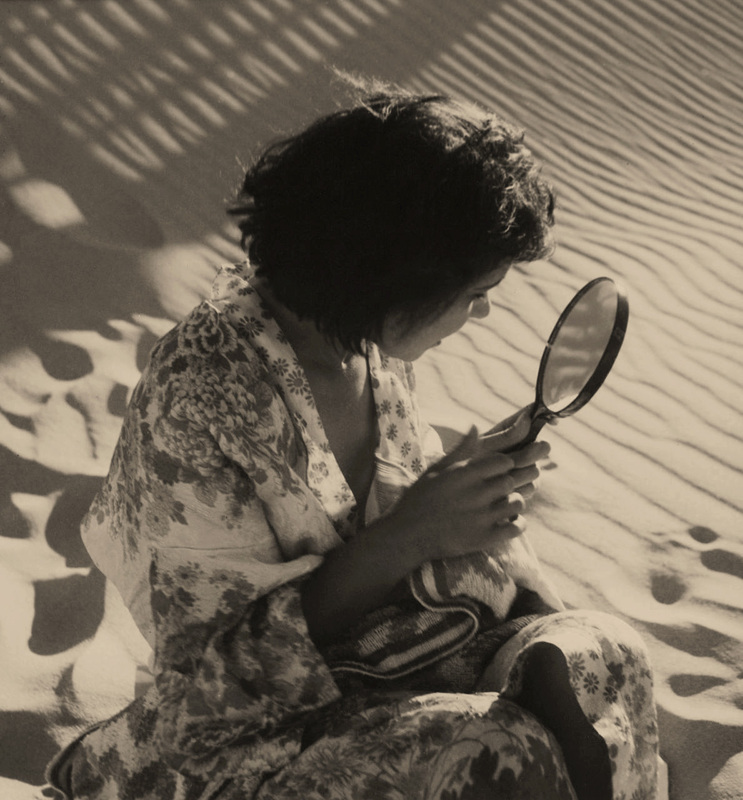 The possibility of being able to fully decipher a photograph’s meaning is remote, even when it has been promptly ordered and annotated in some form of album. 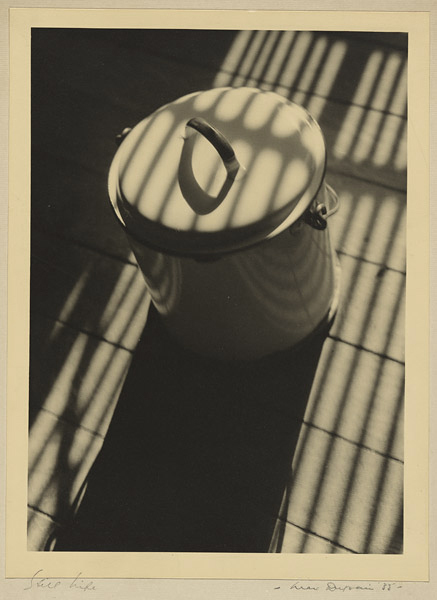 Each photographic form expands the possibility of instant and easy communication, but the swarm of material serves only to prove the impossibility of order, classification, and accuracy. 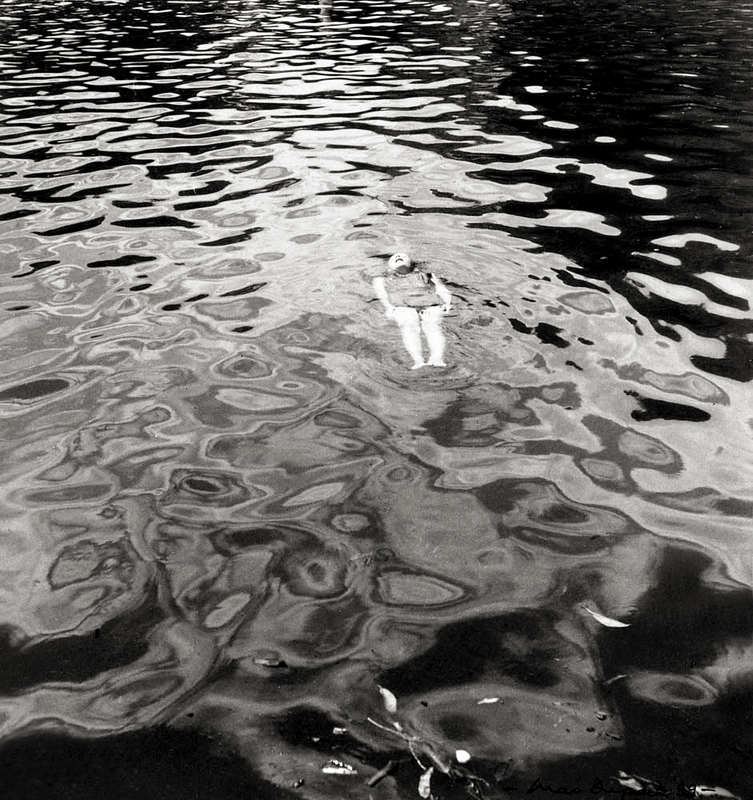 The photograph as an aestheticised object continues regardless of platform, and the imaginative possibilities of the medium have not been exhausted. Sections from Judy Annear. “Introduction,” in Judy Annear. 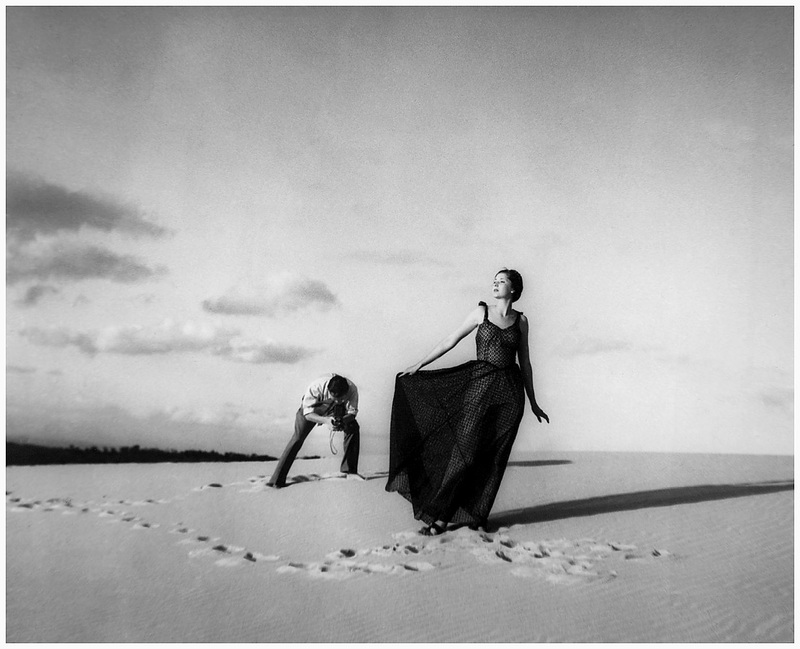 The photograph and Australia. 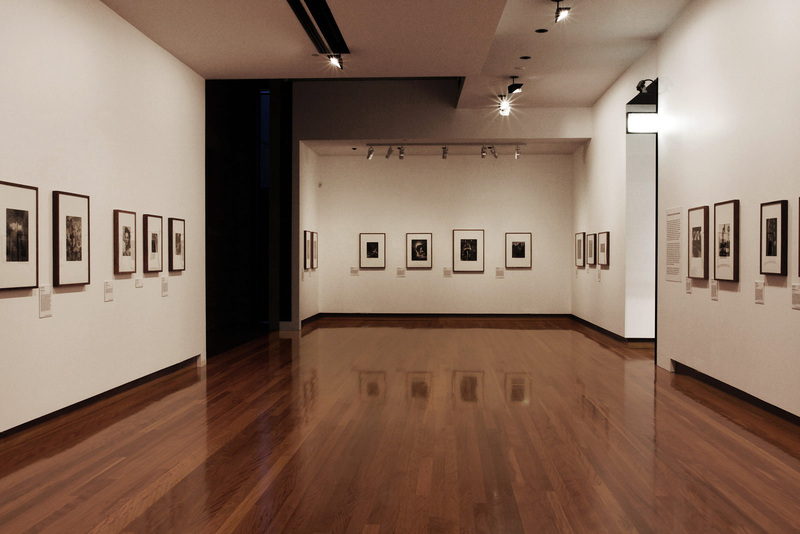 Sydney: Art Gallery of New South Wales, 2015. p. 12. 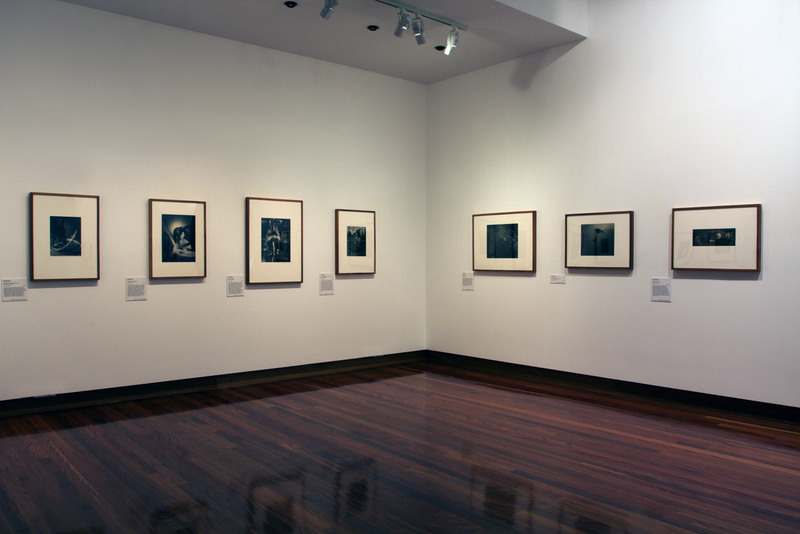 The first photographs of indigenous Australians were formal, posed portraits, taken in blazing sunlight. 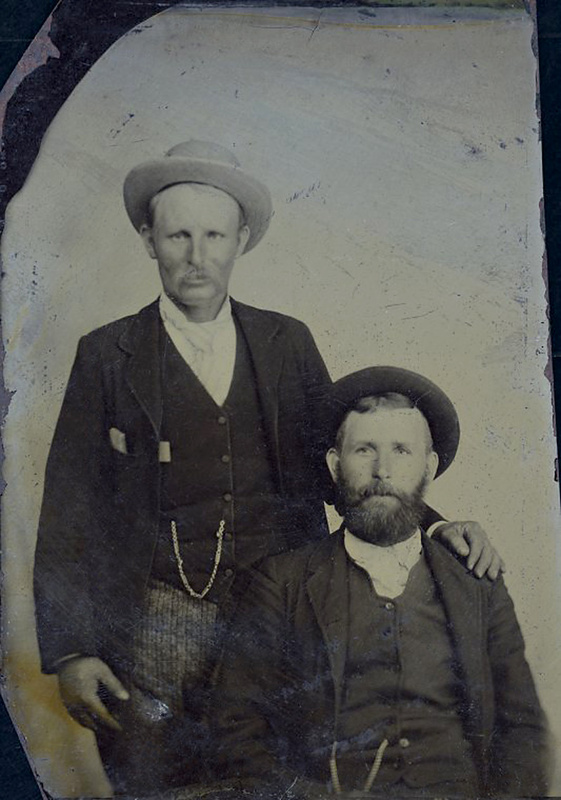 The sitters are often pictured leaning against each other (stillness was required for long exposure times) with eyes turned to the camera and bodies wrapped in blankets or kangaroo skins. Some wore headdresses or necklaces that may or may not have belonged to them. 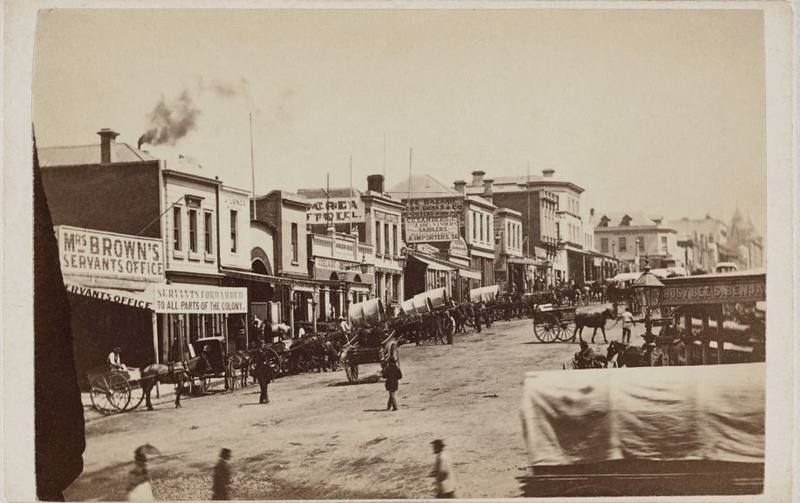 Charles Nettleton was a professional photographer born in the north of England who arrived in Australia in 1854, settling in Melbourne. 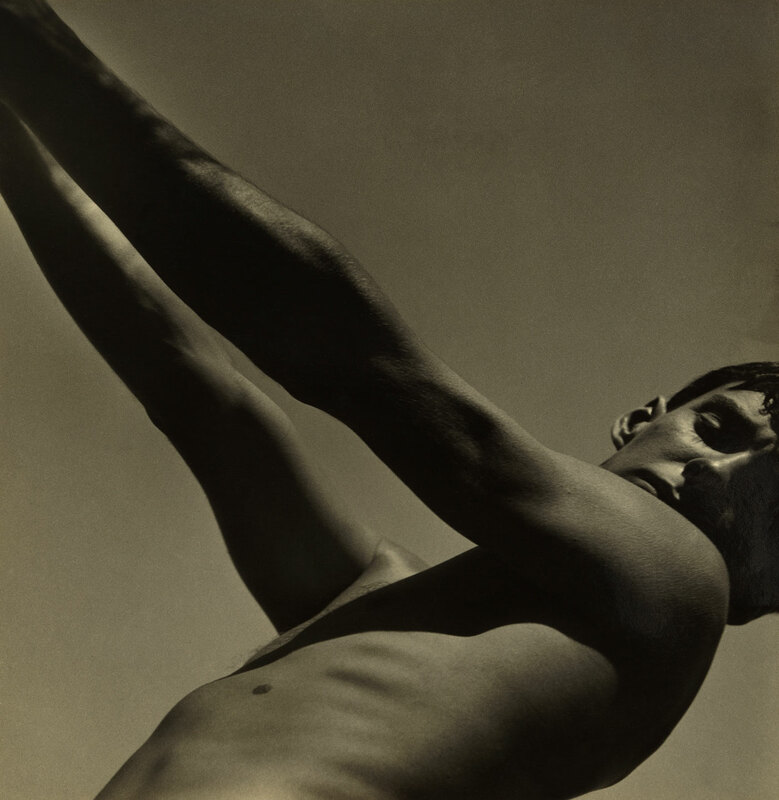 He joined the studio of Townsend Duryea and Alexander McDonald, where he specialised in outdoor photography. Nettleton is credited with having photographed the first Australian steam train when the private Melbourne-Sandridge (Port Melbourne) line was opened on 12 September 1854. 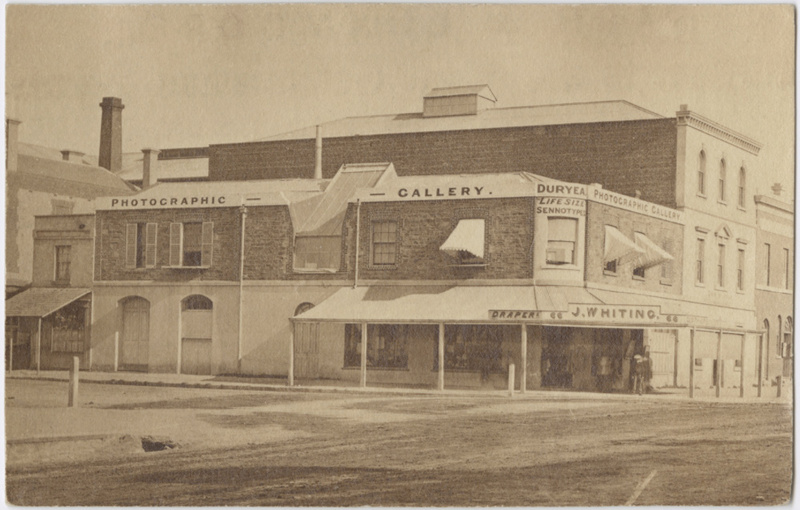 Nettleton established his own studio in 1858, offering the first souvenir albums to the Melbourne public. 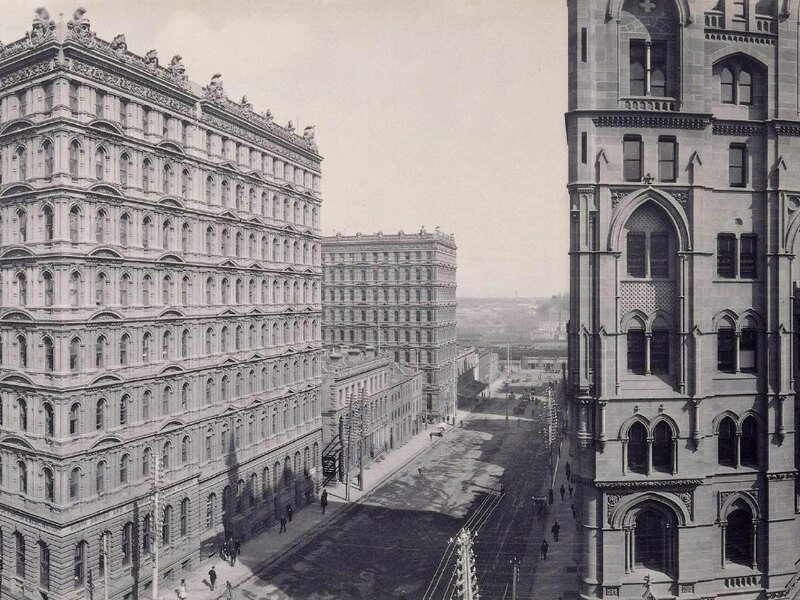 He worked as an official photographer to the Victorian government and the City of Melbourne Corporation from the late 1850s to the late 1890s, documenting Melbourne’s growth from a colonial town to a booming metropolis. 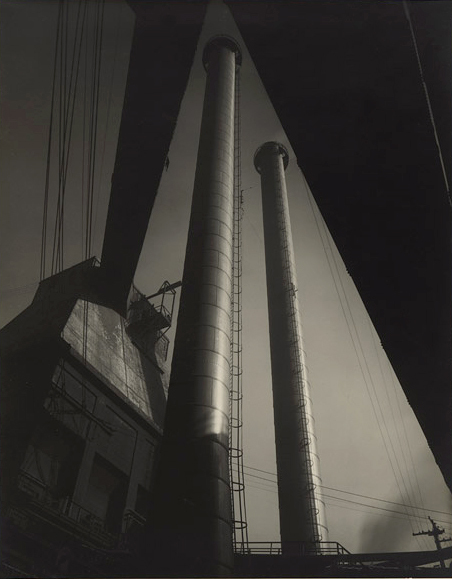 He photographed public buildings, sewerage and water systems, bridges, viaducts, roads, wharves, and the construction of the Botanical Gardens. In 1861 he boarded the ‘Great Britain’ to photograph the first English cricket team to visit Australia and in 1867 was appointed official photographer of the Victorian visit of the Duke of Edinburgh. 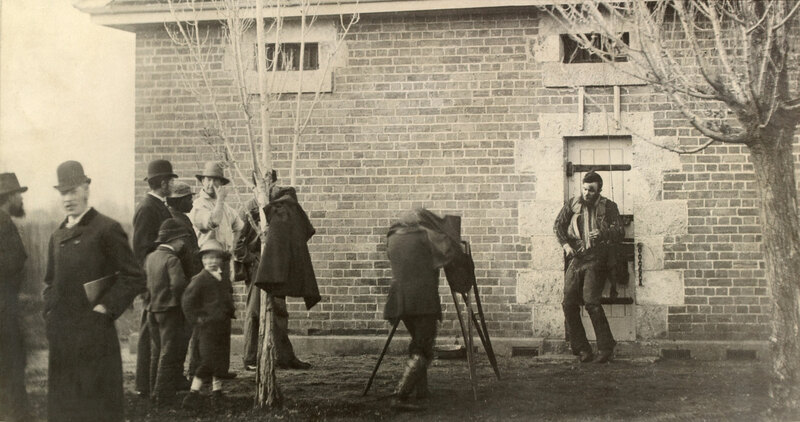 For the Victorian police he photographed the bushranger Ned Kelly in 1880. This is considered to be the only genuine photograph of the outlaw. 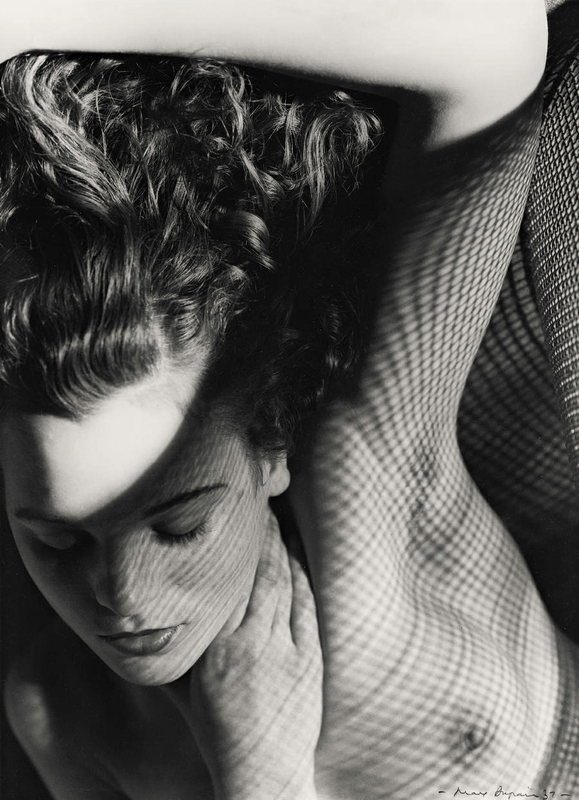 “The Art Gallery of New South Wales is proud to present the major exhibition The photograph and Australia, which explores the crucial role photography has played in shaping our understandings of the nation. It will run from 21 March to 8 June 2015. 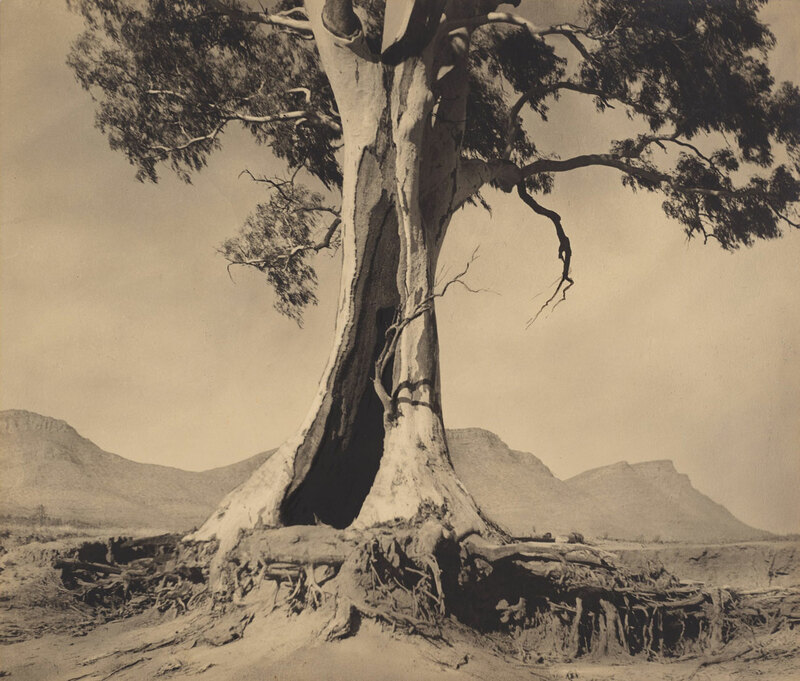 Tracing the evolution of the medium and its many uses from the 1840s until today, this is the largest exhibition of Australian photography held since 1988 that borrows from collections nationwide. 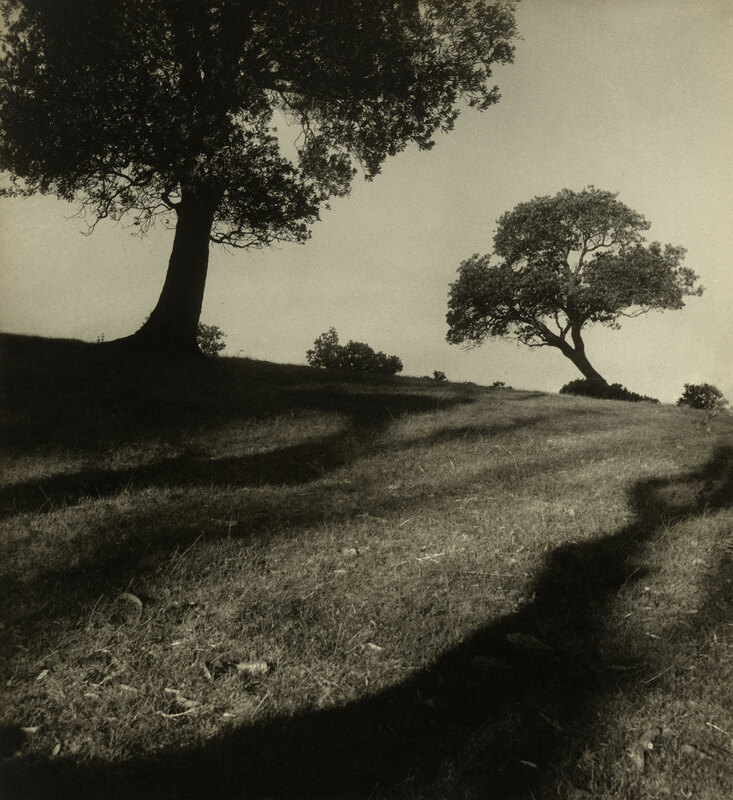 It presents more than 400 photographs by more than 120 artists, including Morton Allport, Richard Daintree, Paul Foelsche, Samuel Sweet, JJ Dwyer, Charles Bayliss, Frank Hurley, Harold Cazneaux, Olive Cotton, Max Dupain, Sue Ford, Carol Jerrems, Tracey Moffatt, Robyn Stacey, Ricky Maynard, Anne Ferran and Patrick Pound. 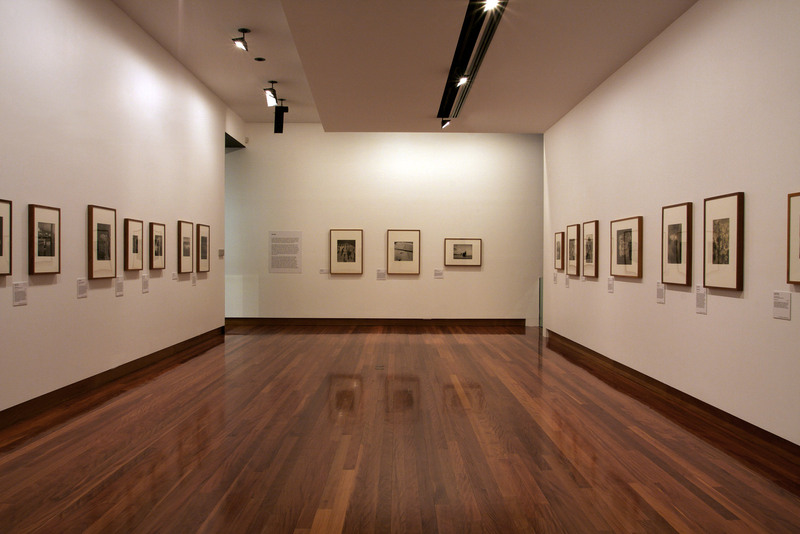 The exhibition brings together hundreds of photographs from more than 35 private and public collections across Australia, England and New Zealand, including the National Gallery of Australia, the National Library of Australia and the State Library of Victoria. 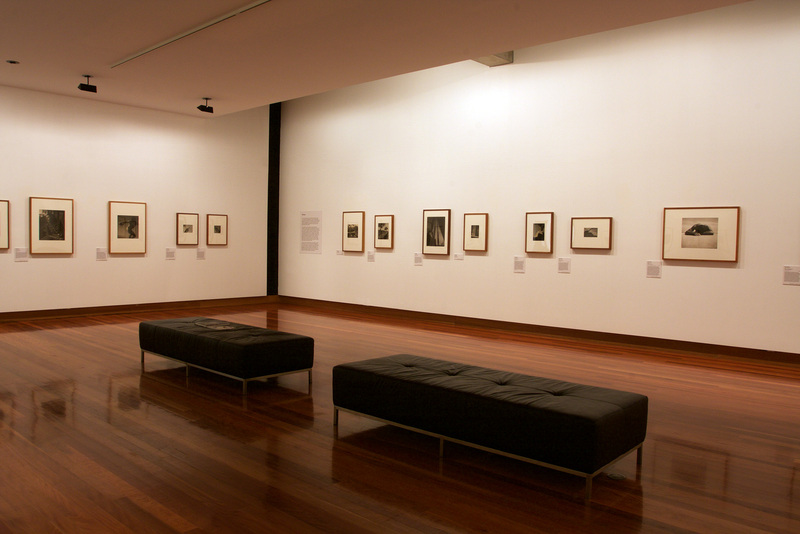 Highlights include daguerreotypes by Australia’s first professional photographer, George Goodman, and recent works by Simryn Gill. 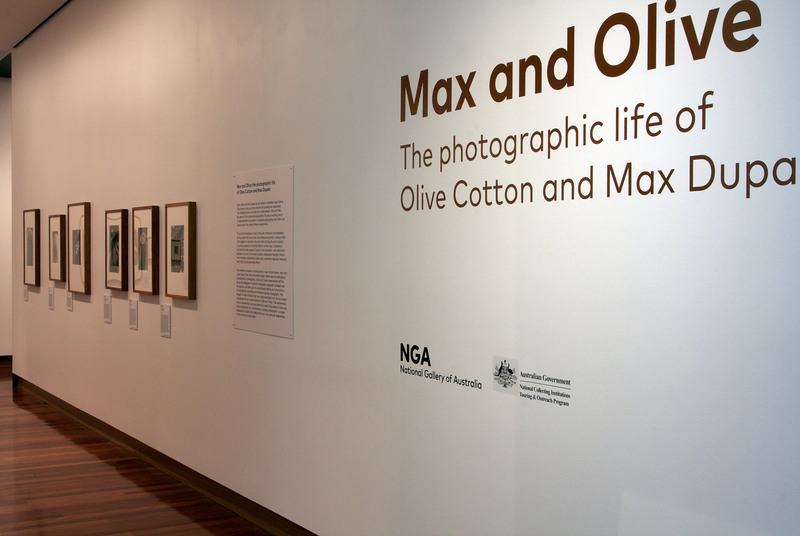 From mass media’s evolution in the 19th century to today’s digital revolution, The photograph and Australia investigates how photography has been harnessed to create the idea of a nation and reveals how our view of the world, ourselves and each other has been changed by the advent of photography. 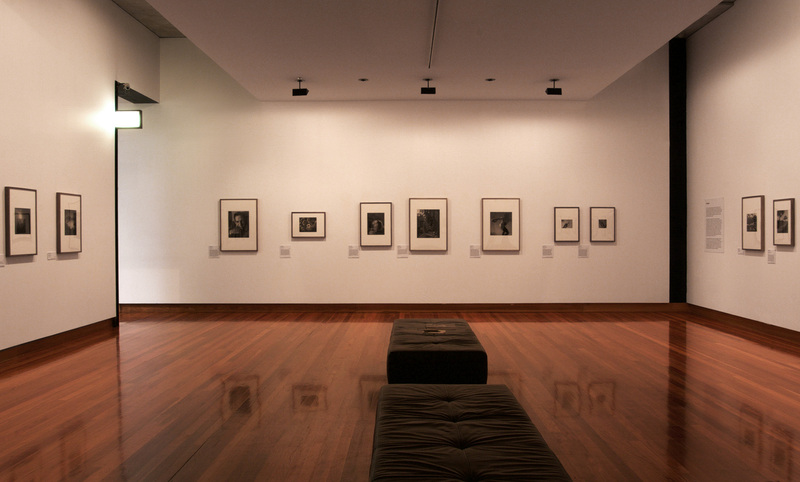 It also explores how photography operates aesthetically, technically, politically and in terms of distribution and proliferation, in the Australian context. 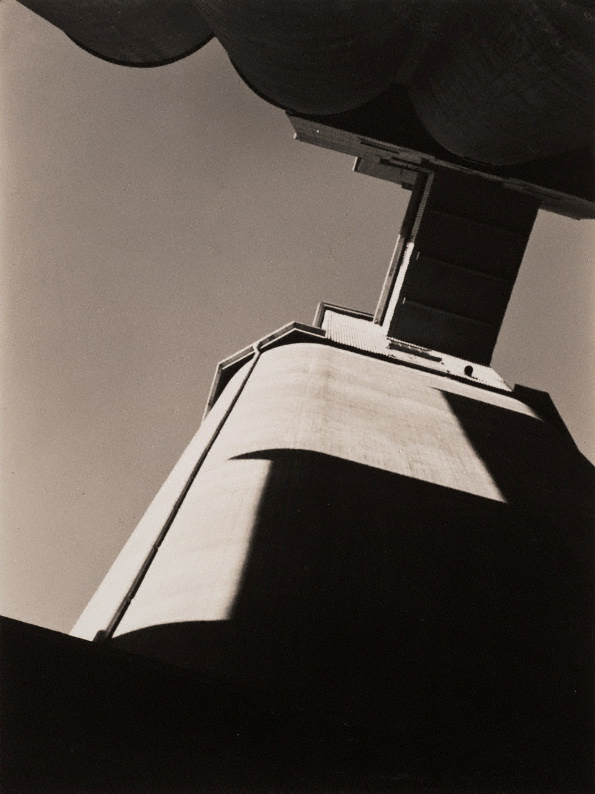 David Moore’s career spanned the age of the picture magazines (for example: Life, Time, The Observer) through to major commissions such as the Sydney Opera House, CSR, and self initiated projects like To build a Bridge: Glebe Island. 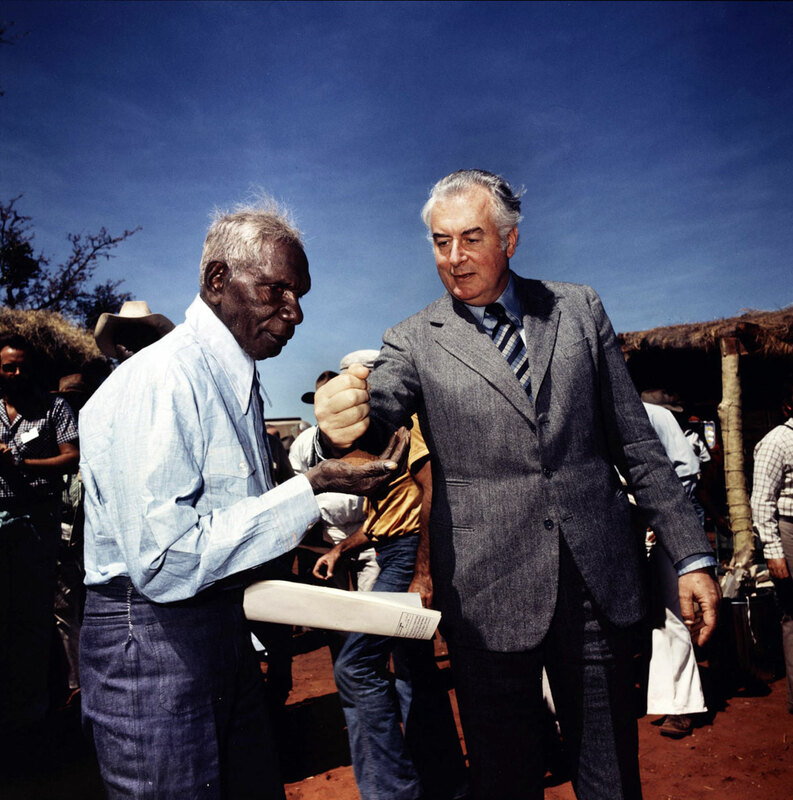 The breadth and depth of his career means there is an extraordinary archive of material which describes and interprets the last 50 years of Australian life, the life of the region, and events in Britain and the United States. 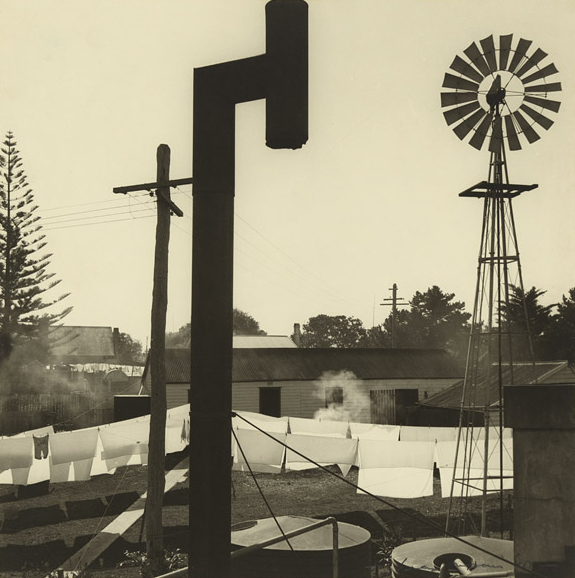 He was instrumental in advancing Australian photography throughout his career and in the early 1970s was active in setting up the Australian Centre for Photography, Sydney. 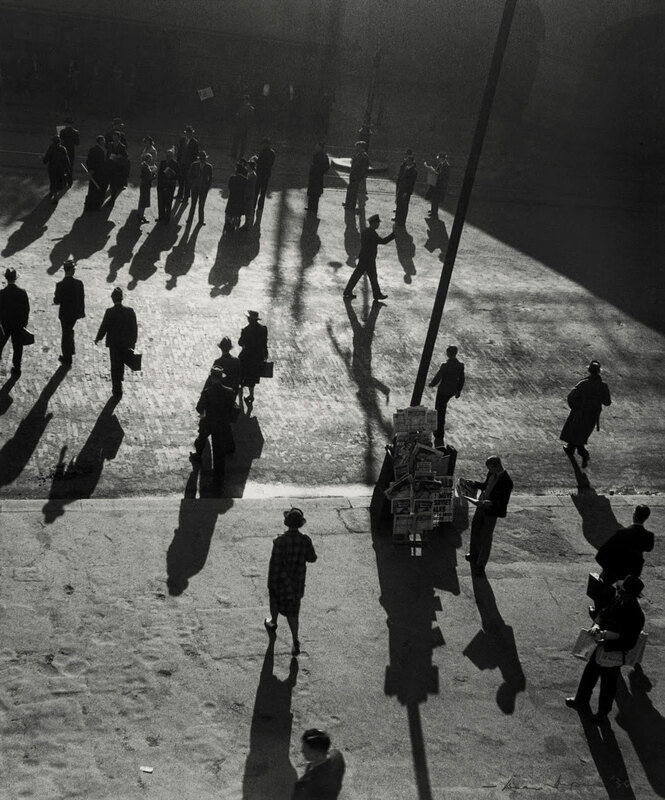 From well-known images such as Migrants arriving in Sydney to Redfern interior, Moore has documented events and conditions in Sydney. 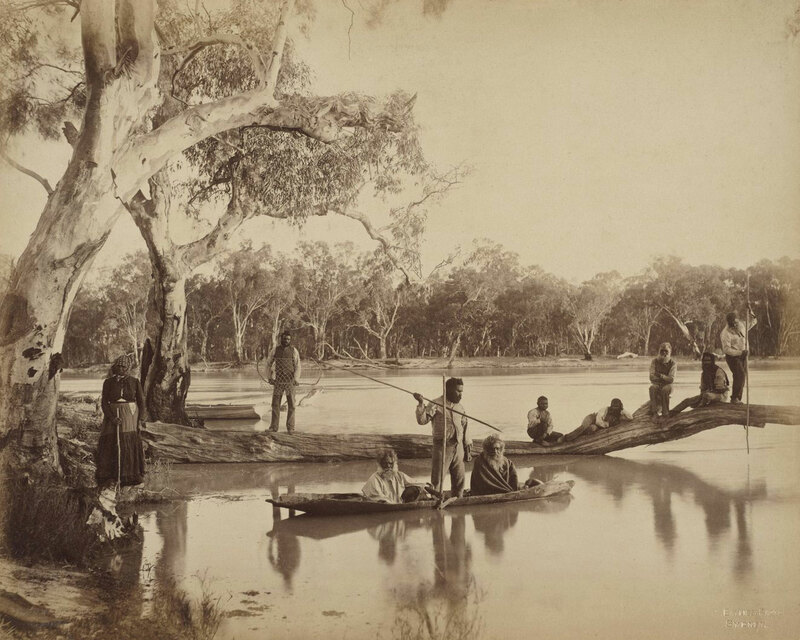 This photo of people relaxing on the banks of the Adelaide River in the Northern Territory was taken by Paul Foelsche, a policeman and amateur anthropologist. 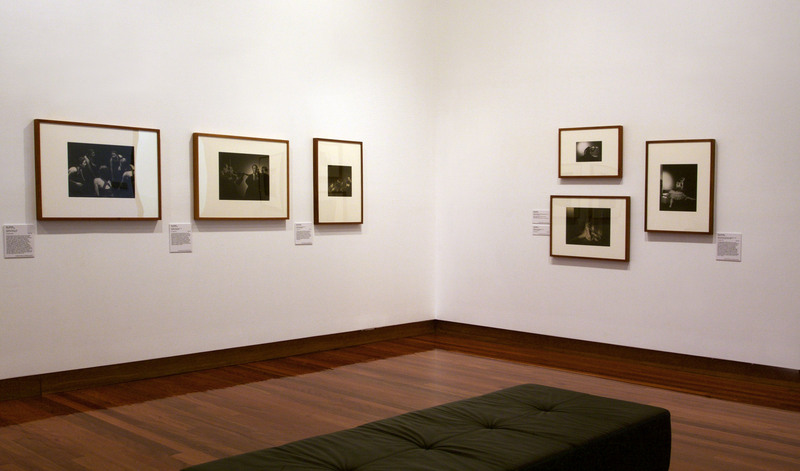 The collection of 19th century images brought together in The photograph and Australia show indigenous people in formal group portraits or as “exotic” subjects. 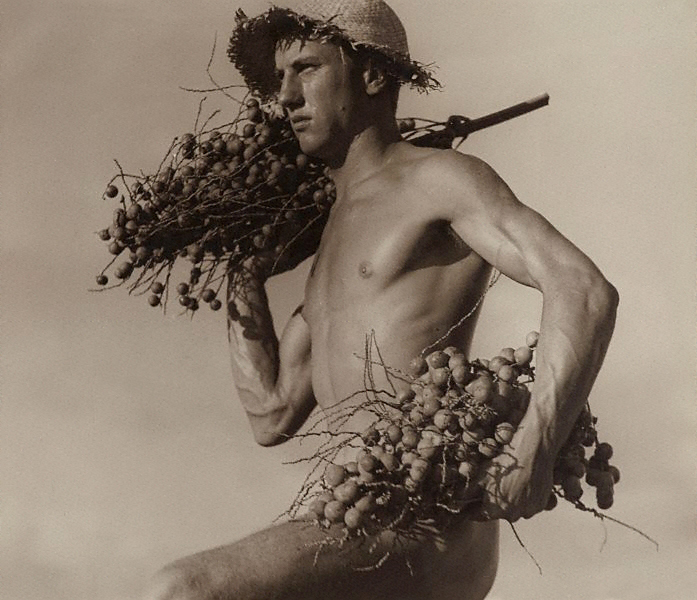 They are photographed alongside early settlers, working as stockmen or holding tools. 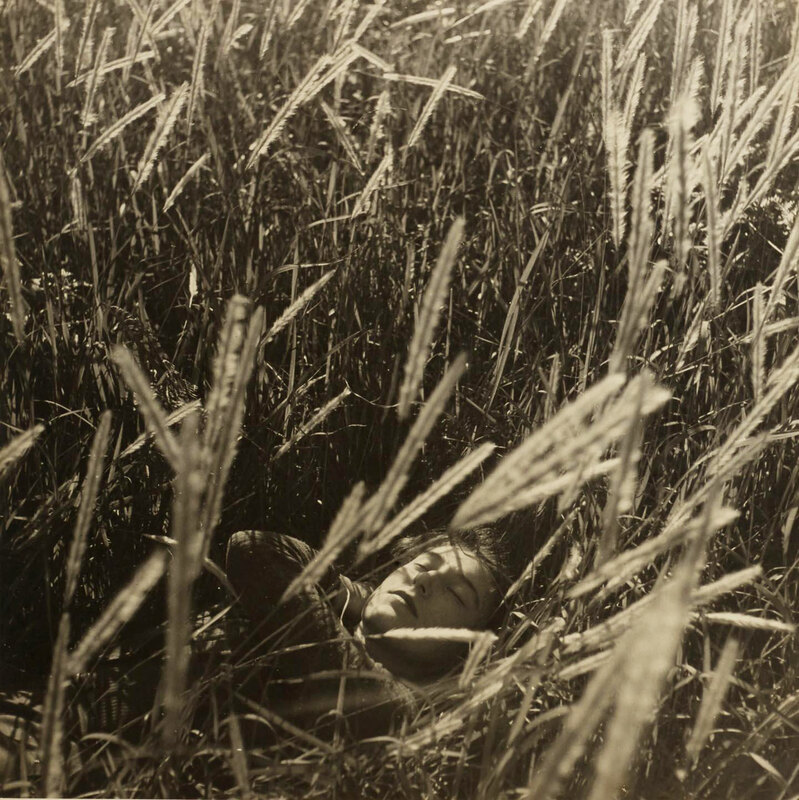 Amateur gentleman photographers such as the Scottish farmer John Hunter Kerr captured such images on his own property, Fernyhurst Station, in Victoria. Another amateur photographer, Paul Foelsche, the first policeman in the Northern Territory, took portraits of the Larrakia people, which have since become a priceless archive for their descendants. Australia’s first ever press photograph pushed boundaries few journalists would transgress today. 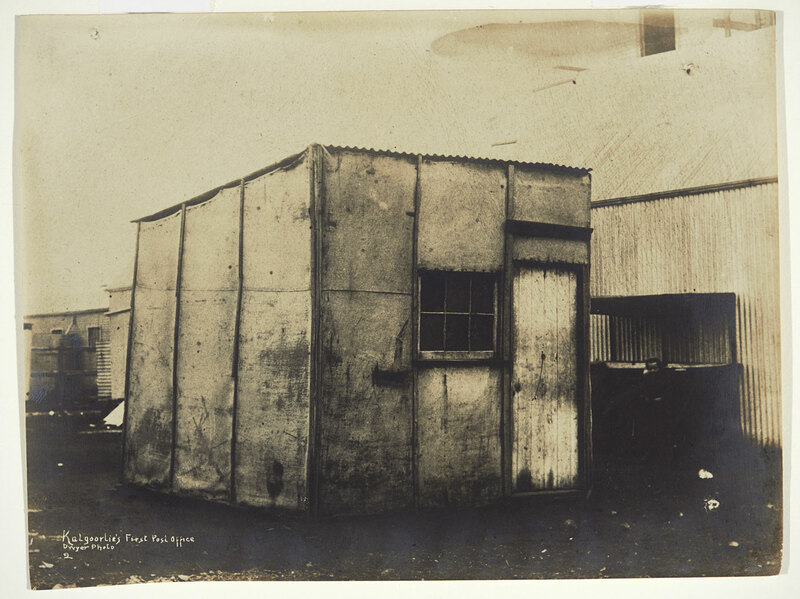 Captured by J.W, Lindt in 1880, the photo shows the dead body of a member of Ned Kelly’s infamous gang, strung up on a door outside the jail house in Benalla in regional Victoria. 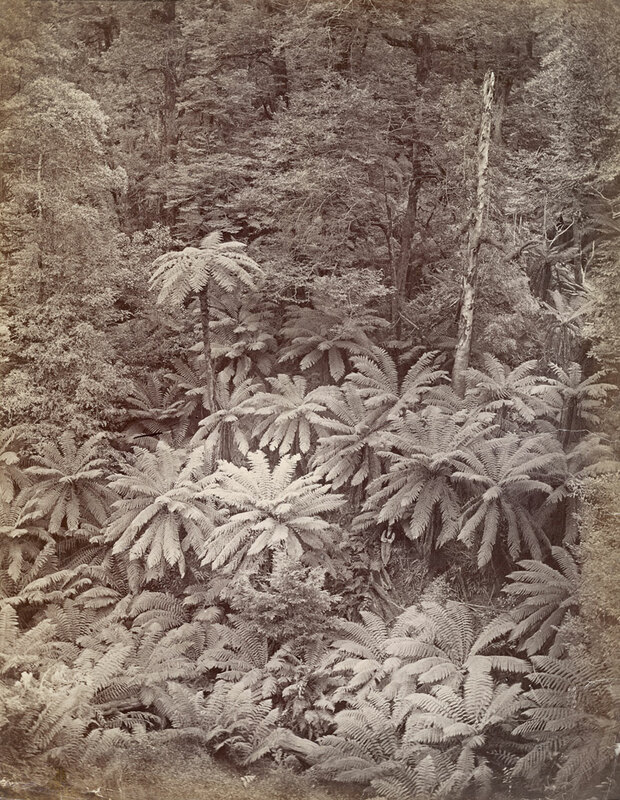 This image was an albumen photograph (using egg whites to bind chemicals to paper) which was then hand-coloured with oil paints to bring it to life. 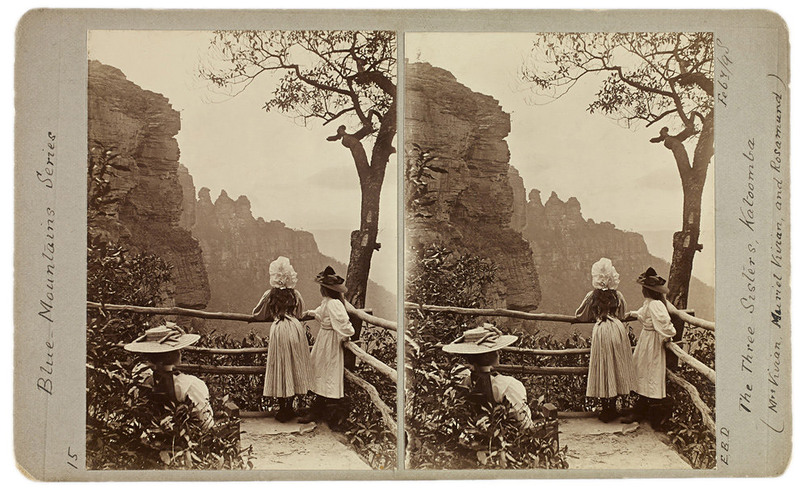 The photographer took it in the 1860s to advertise Australia as a land of opportunity. 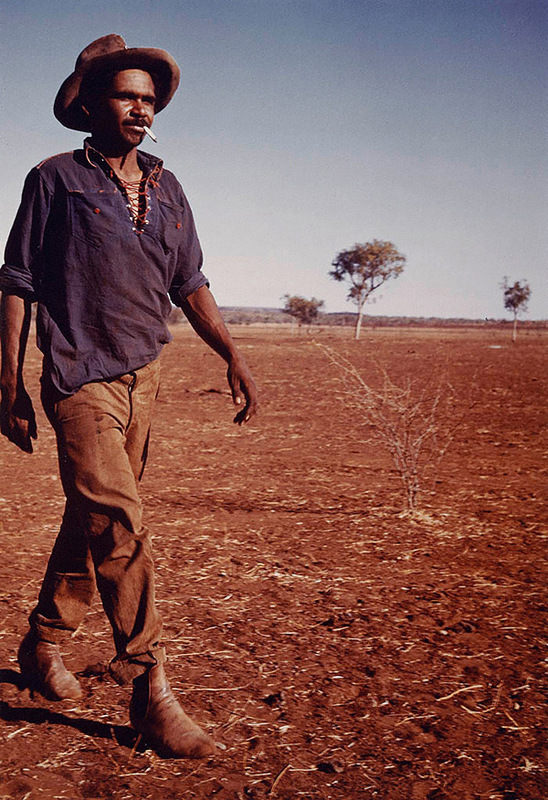 Ricky Maynard has produced some of the most compelling images of contemporary Aboriginal Australia over the last two decades. 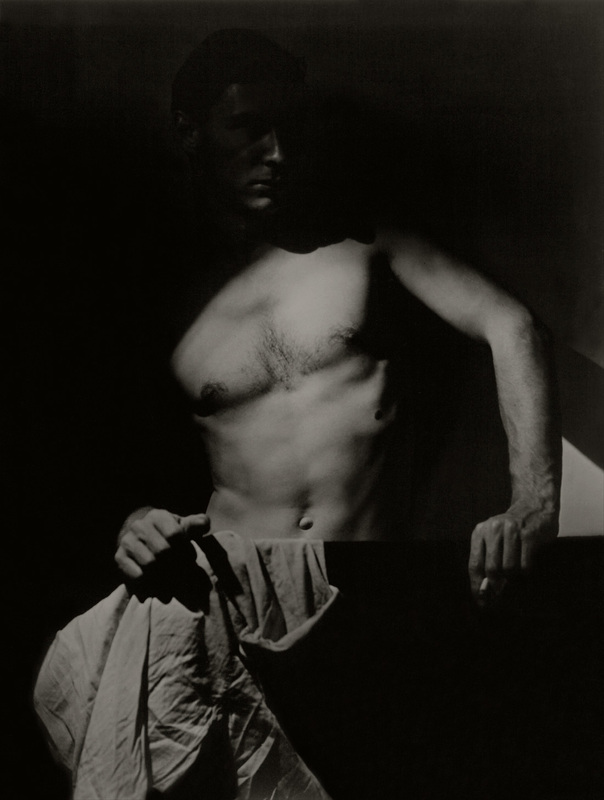 Largely self taught, Maynard began his career as a darkroom technician at the age of sixteen. He first established his reputation with the 1985 series Moonbird people, an intimate portrayal of the muttonbirding season on Babel, Big Dog and Trefoil Islands in his native Tasmania. 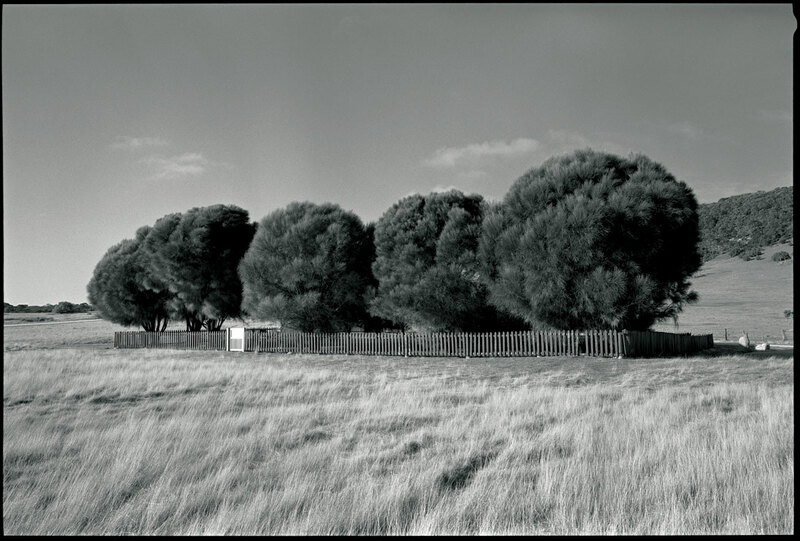 The 1993 series No more than what you see documents Indigenous prisoners in South Australian gaols. 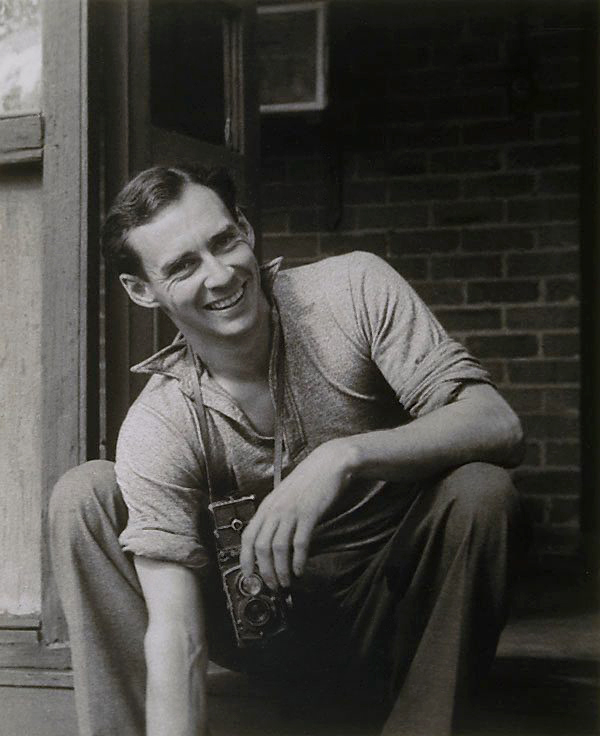 Maynard is a lifelong student of the history of photography, particularly of the great American social reformers Jacob Riis, Lewis Hines, Dorothea Lange and Walker Evans. 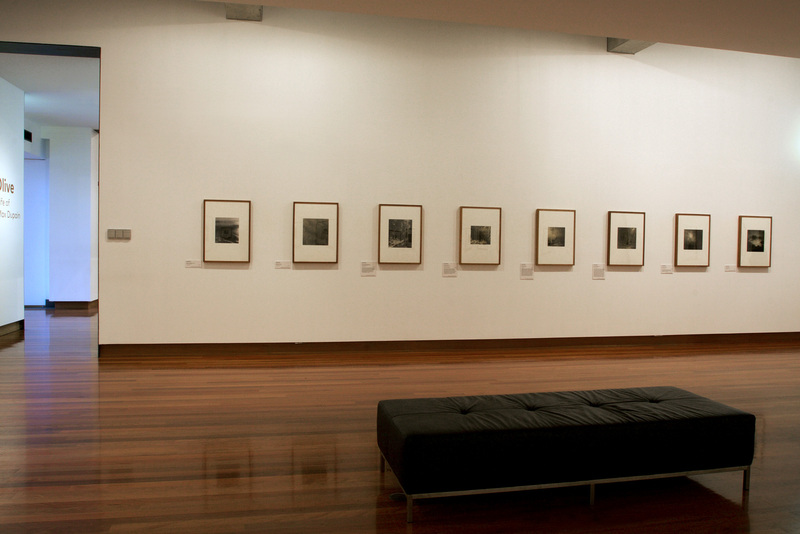 Maynard’s images cut through the layers of rhetoric and ideology that inevitably couch black history (particularly Tasmanian history) to present images of experience itself. His visual histories question ownership; he claims that ‘the contest remains over who will image and own this history…we must define history, define whose history it is, and define its purpose as well as the tools used for the telling it’. 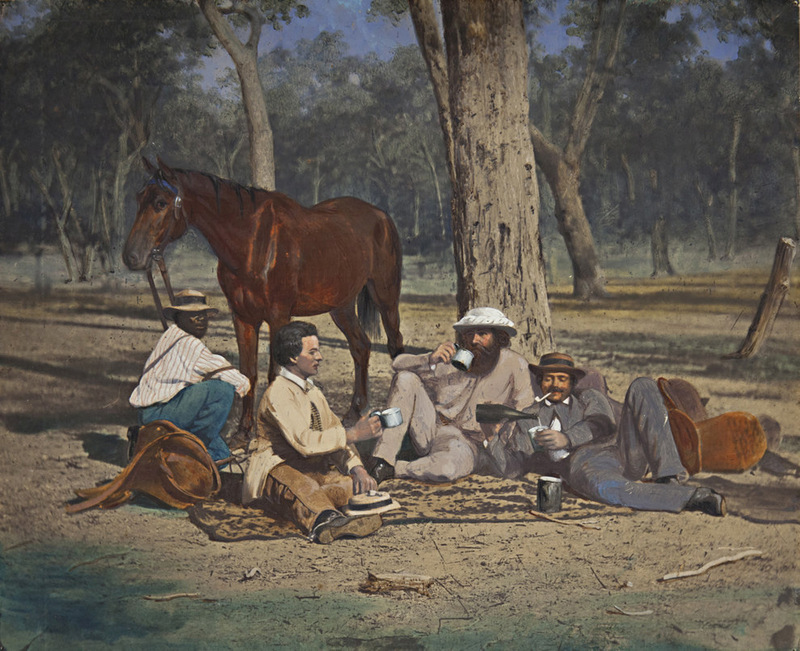 Professional photographers such as the Frankfurt-born John William Lindt (who became famous for photographing the capture of the Kelly Gang at Glenrowan in 1880) took carefully posed tableaux images in his Melbourne studio. One set of Lindt photographs, taken between 1873 and 1874, show settlers and indigenous people posing with the tools of their trade. 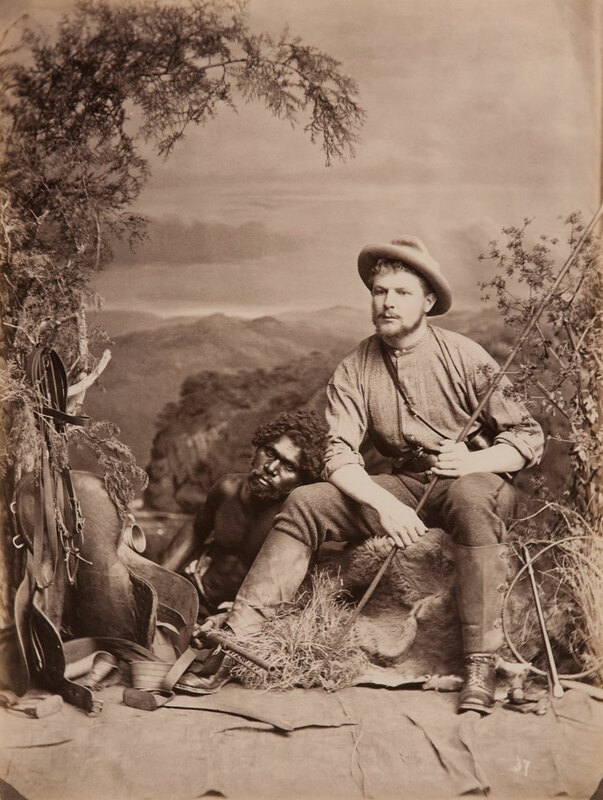 One unusual image shows a settler holding a spear and a local man holding a rifle. 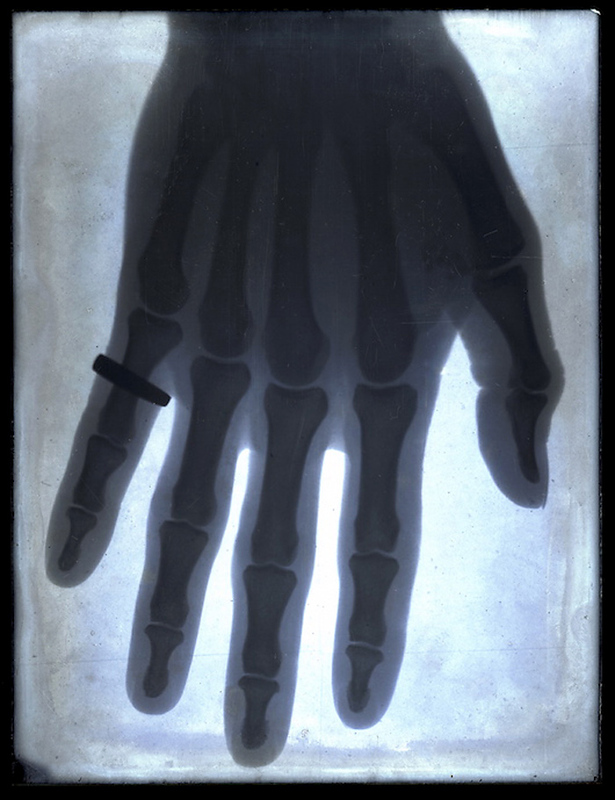 “In the late 19th century, cameras were taking us both inside the human body and all the way to the moon. 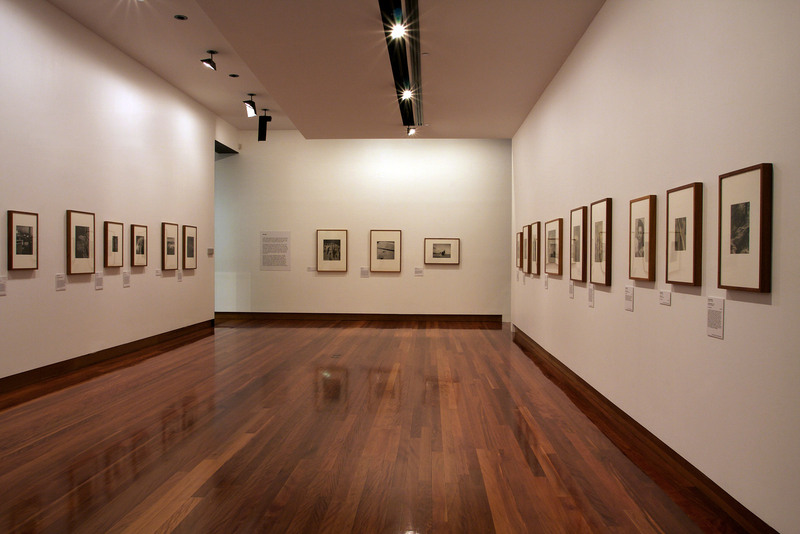 By the 1970s the National Gallery of Victoria had begun collecting photographic art, and within another decade the digital revolution was underway. 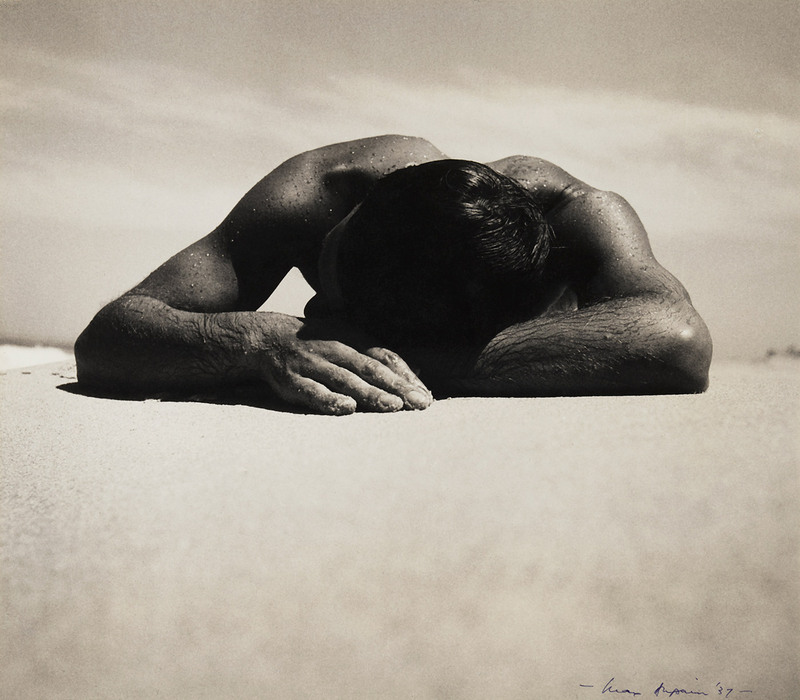 But this exhibition – the largest display of Australian photography since Gael Newton mounted the 900-work Shades of Light: Photography and Australia 1838-1988 at the National Gallery of Australia 27 years ago – is not chronological. 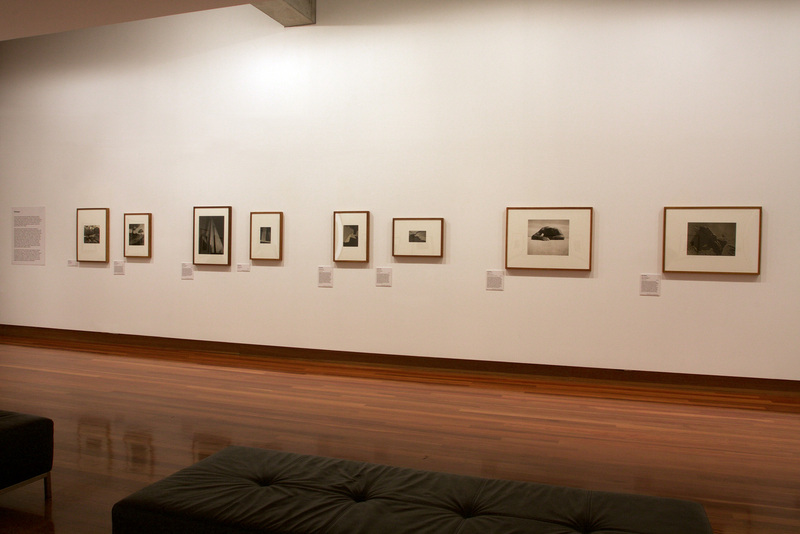 It opens with a salon hang of portraits of 19th and 20th century photographers, as if to emphasise their say in what we see, and continues with works grouped by themes: Aboriginal and settler relations; exploration; mining, landscape and stars; portraiture and engagement; collecting and distributing photography. 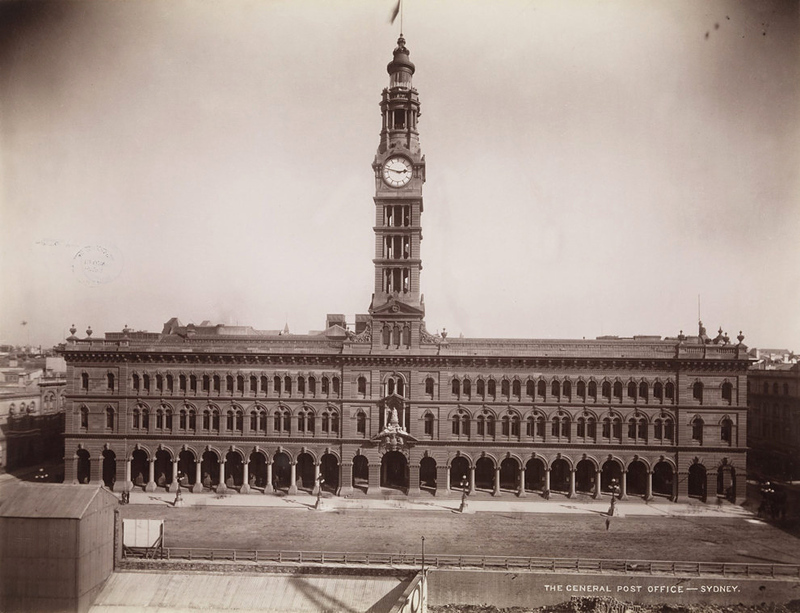 Most of the photographs – about three quarters of the show, in fact – date from the first 60 years after Frenchman Louis Daguerre had his 1839 revelation about how to capture detailed images in a permanent form. 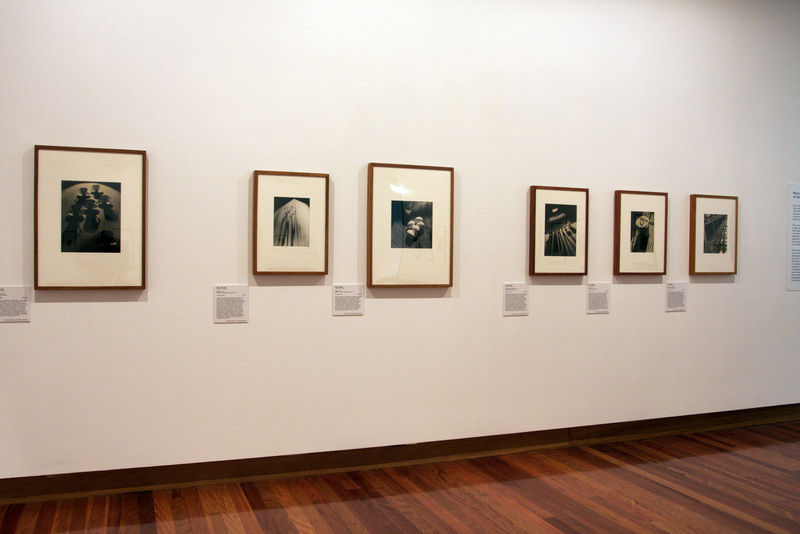 Annear says the decades immediately following photography’s arrival in Australia provide a snapshot of all that has followed since. 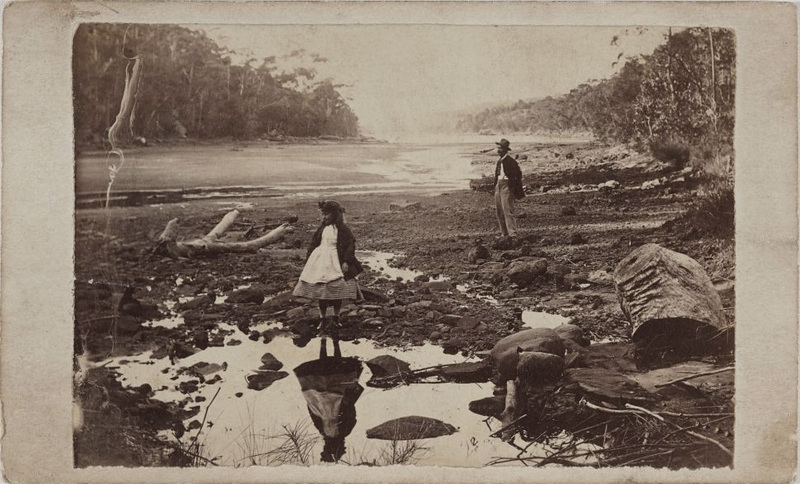 There are quite a few of these small card-mounted photographs (the process was patented in Paris, hence the French) in the exhibition too, including one of a woman reflected in water at Port Jackson dating from circa 1865. With the trillions of images now in existence, it is easy to forget that once upon a time catching your reflection in the water, glass or a mirror was the only way to glimpse your own image (short of paying hefty sums for an artist to draw you). 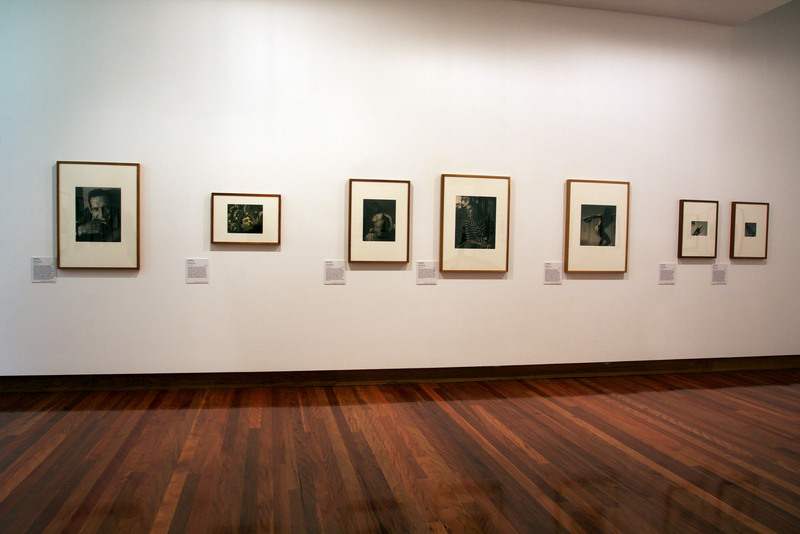 Though not born in Australia, Axel Poignant’s work is largely about the ‘Outback’, its flora and fauna and the traditions of Australian and Indigenous identity. 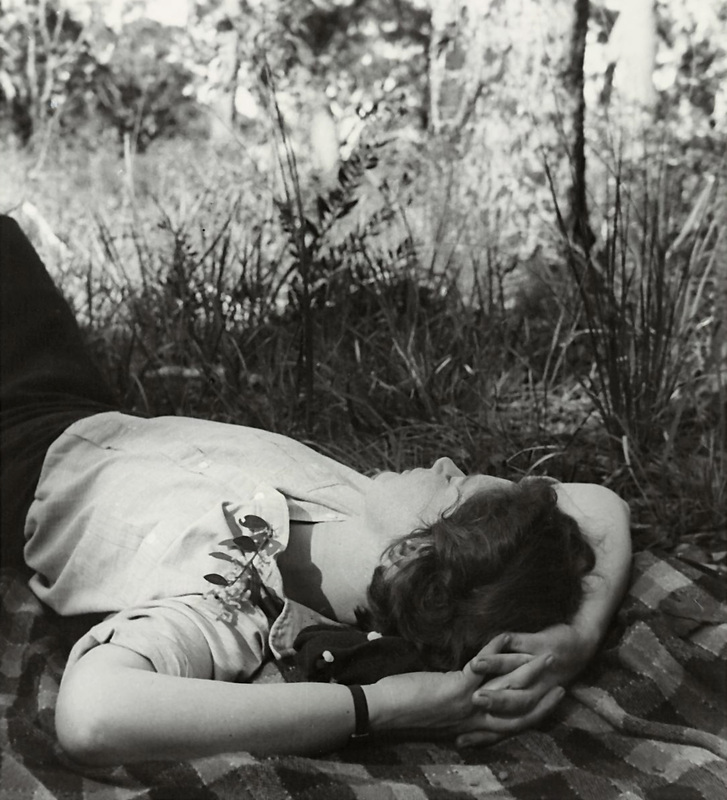 Poignant was born in Yorkshire in 1906 to a Swedish father and English mother, and arrived in Australia in 1926 seeking work and adventure. 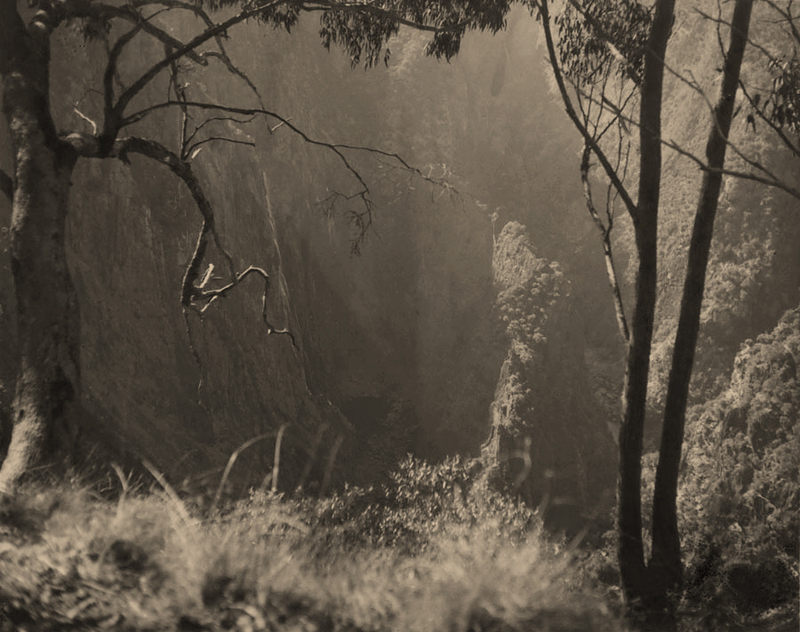 After tough early years of unemployment and homelessness, he eventually settled in Perth and found work as a portrait photographer, before taking to the road and the bush in search of new subjects. 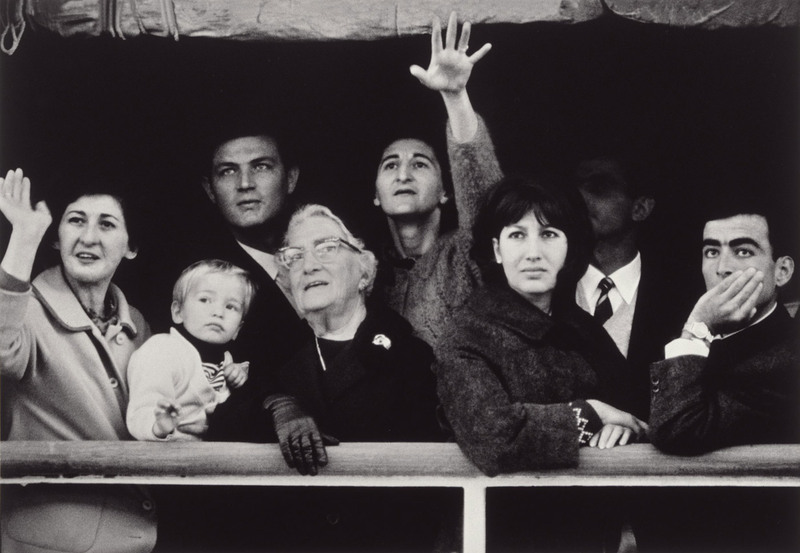 Poignant became fascinated with the photo-essay as a means of adding real humanity to the medium, and much of his work is in this form. 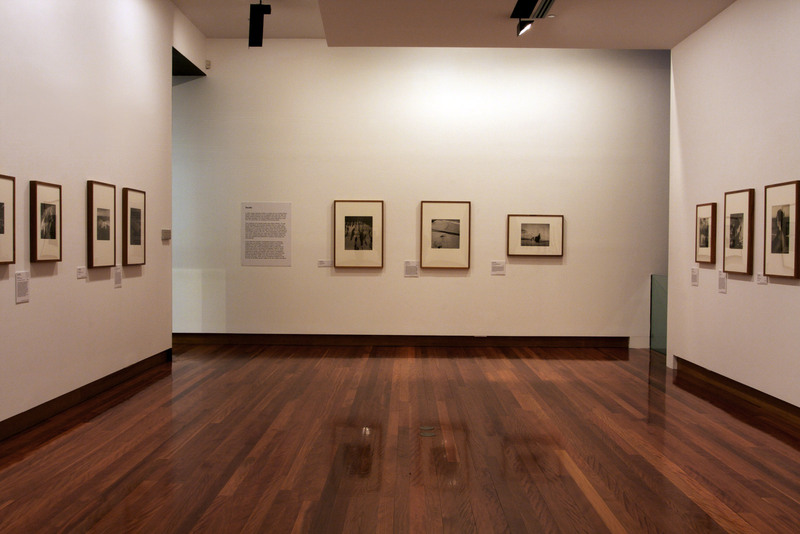 The close relationships he developed with Aborigines on his travels are recorded in compassionate portraits of these people and their lives – the low angles and closely cropped frames appear more natural and relaxed than the stark compositions of earlier ethnographic photography.